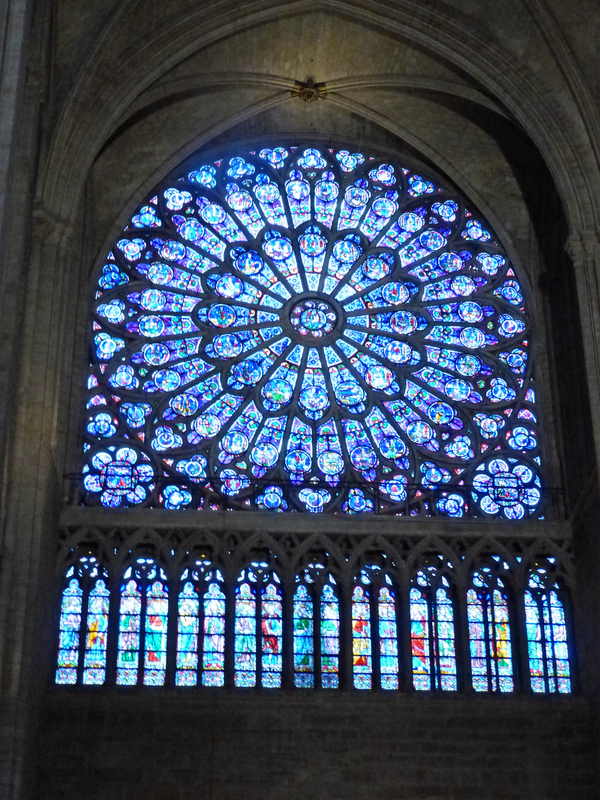 One of the three famous rose windows in Notre Dame cathedral. 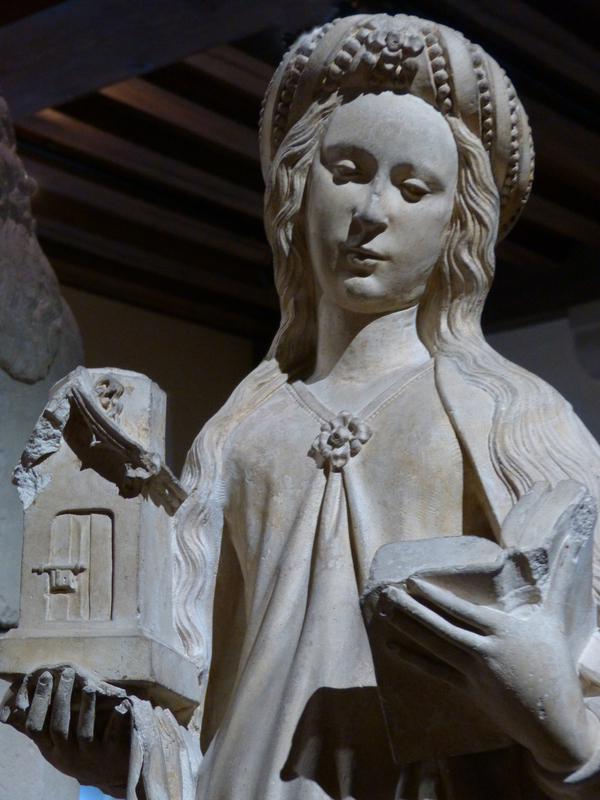 This one dates from the year 1250. It was a sunny day today so I walked around the oldest part of Paris. 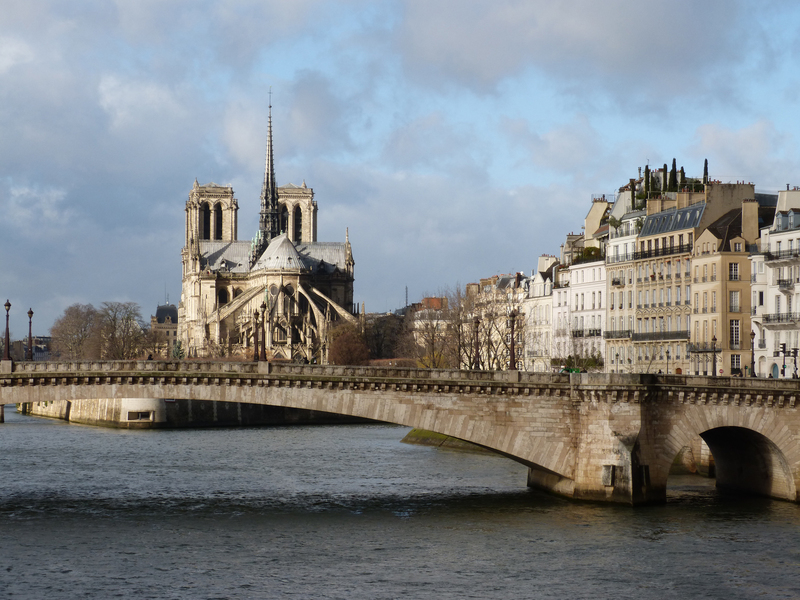 Originally the city was located on an island in the middle of the river Seine where the Notre Dame cathedral stands. 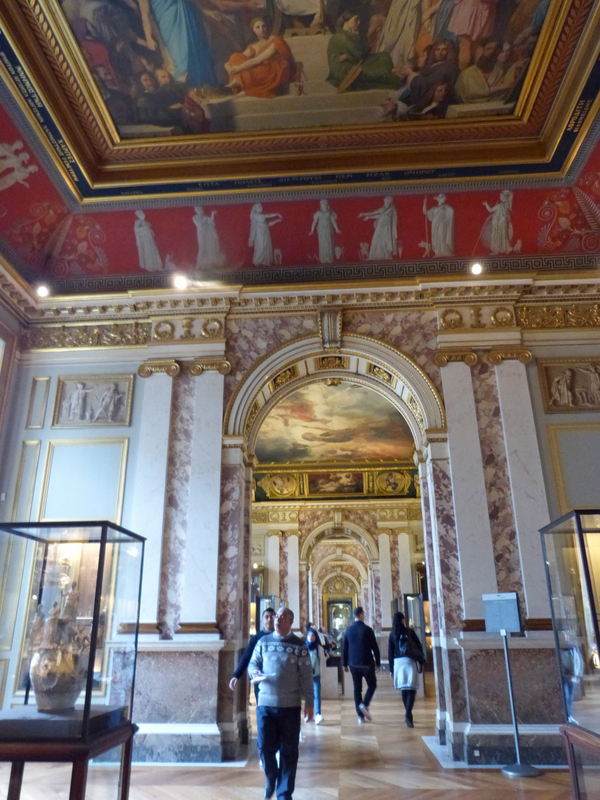 I began the day exploring the area north of the river and north of the Louvre. I went to the “garden” of a palace built in the 1630s. It’s known as the Palais Royal. I put the word garden in quotation marks because formal French gardens are nothing like what we would call a garden. Often, as in this case, there’s no grass, just sand, and long rows of trees that are kept rigidly pruned. 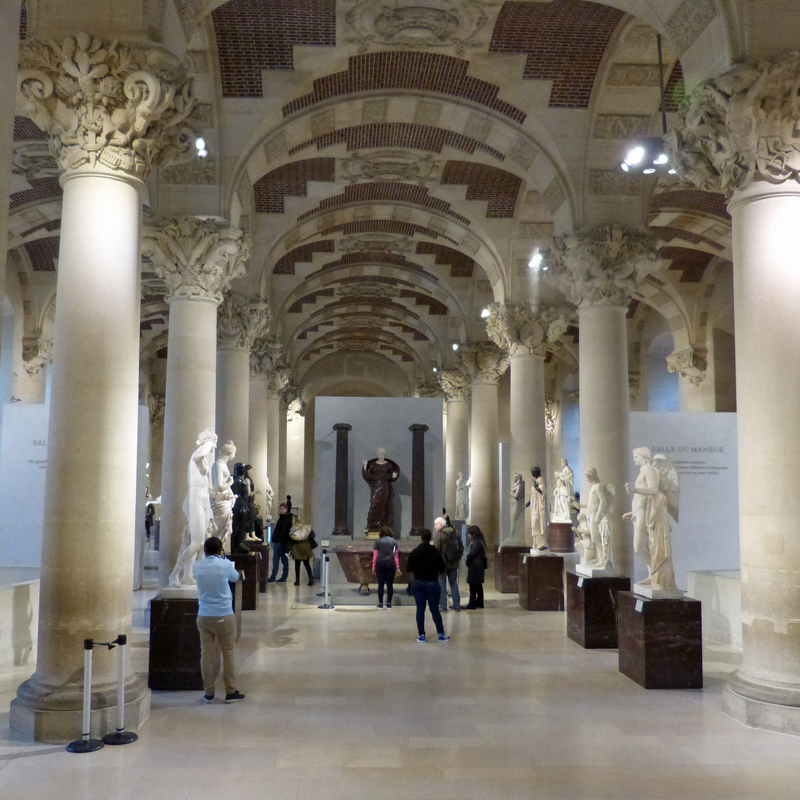 This garden is surrounded by buildings with an arcade of columns dating from the mid-1600s. Today very expensive shops are in those buildings on the ground floor. Here are a few shots of what I saw. 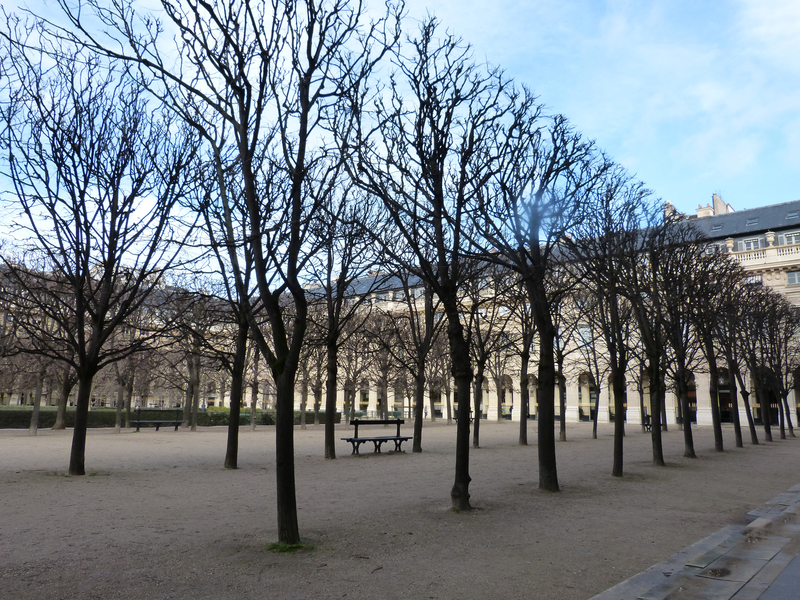 A view of the garden at the Palais Royal in the center of Paris. 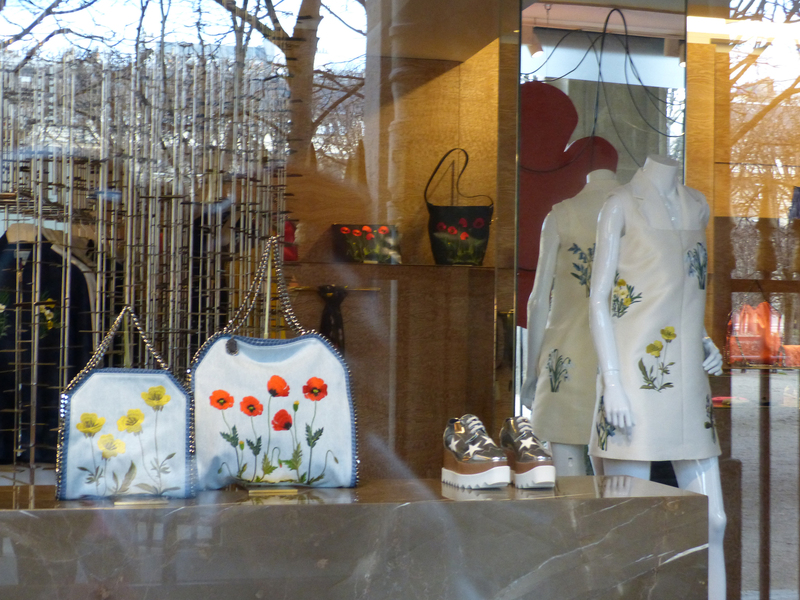 Among the shops I saw, this one belonging to designer Stella McCartney (Paul’s daughter). Stella’s spring window made me think that a woman needs to be young, tall, thin, and rich to shop here — bad taste might come in handy too! 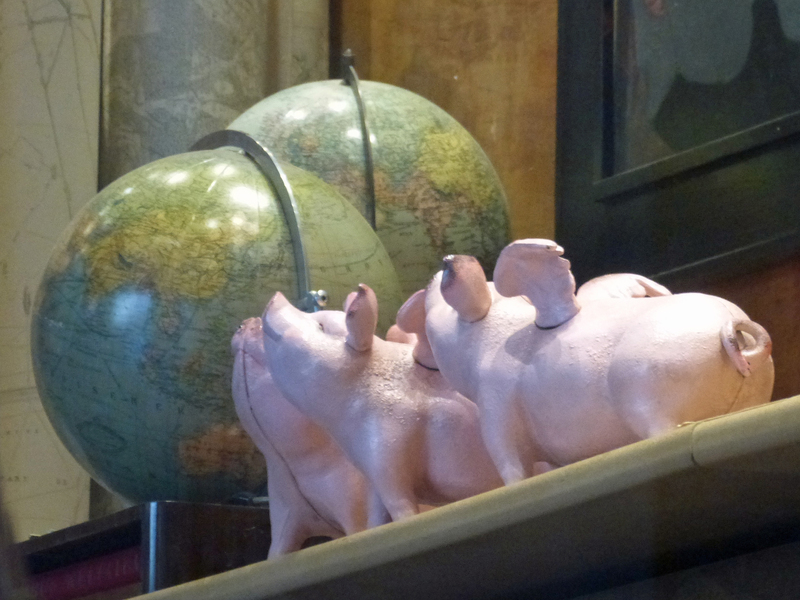 Another shop I saw today featured flying pigs. I like them! 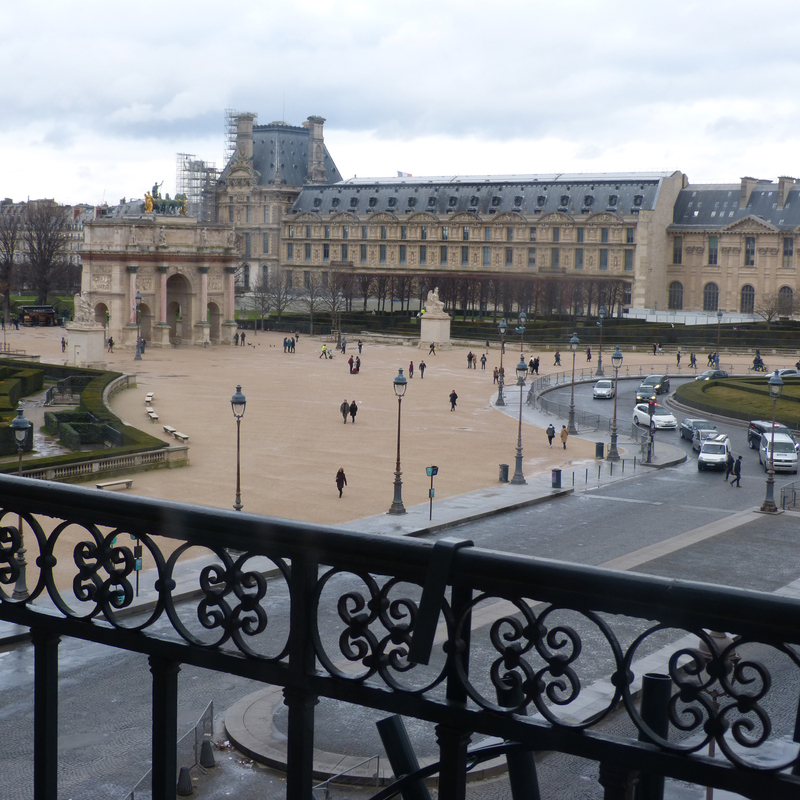 I walked across the courtyard of the Louvre and down to Ile de la Cité, the island where Notre Dame is located. For the first time I was able to sneak a photo of the armed guards I’ve been writing about. 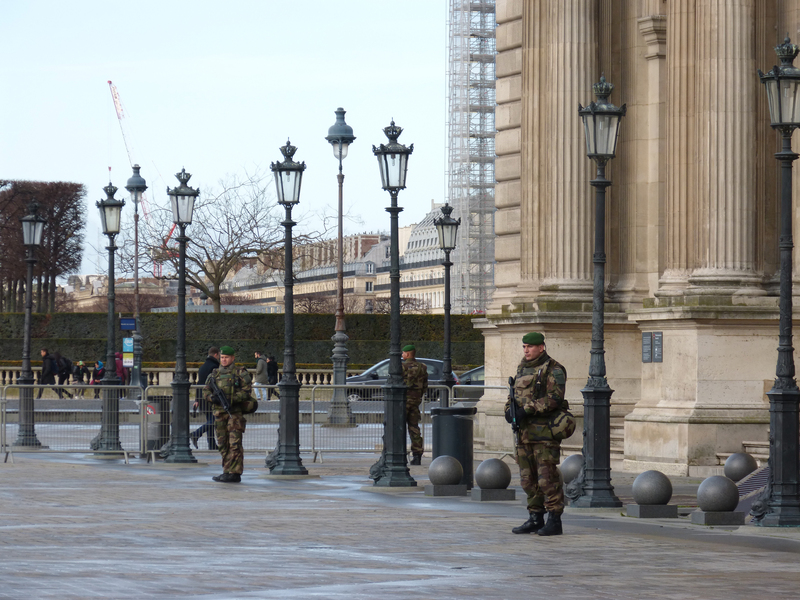 Here are three of a group of five standing together outside the Louvre. There’s a flower market there. 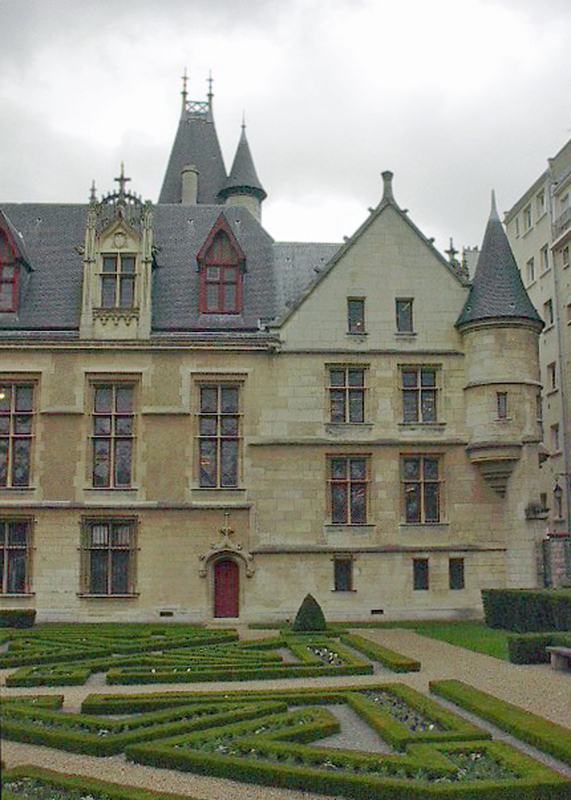 The headquarters of the French police and court system are there too, as well as a lovely small church called Sainte Chapelle. 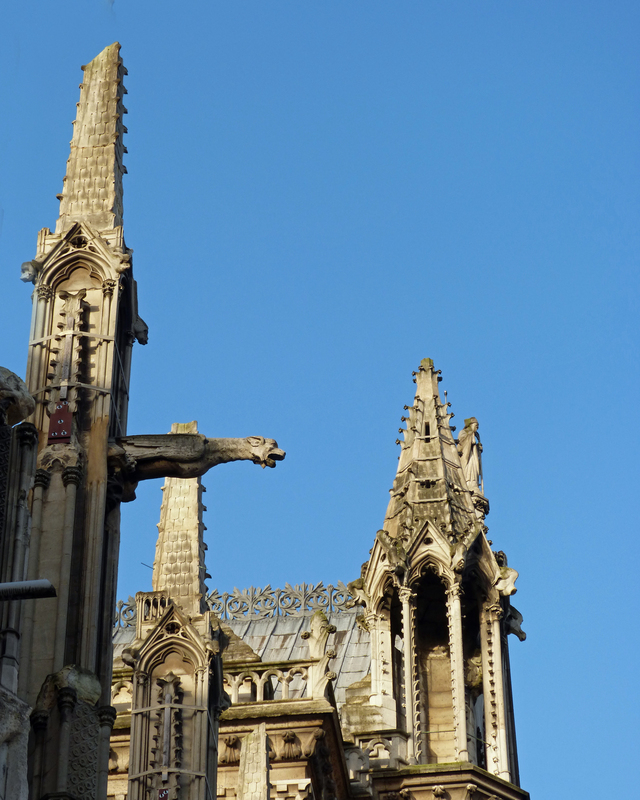 The steeple on the left is above Sainte Chapelle, built before the year 1248. It is two stories tall and the walls are almost entirely stained glass. 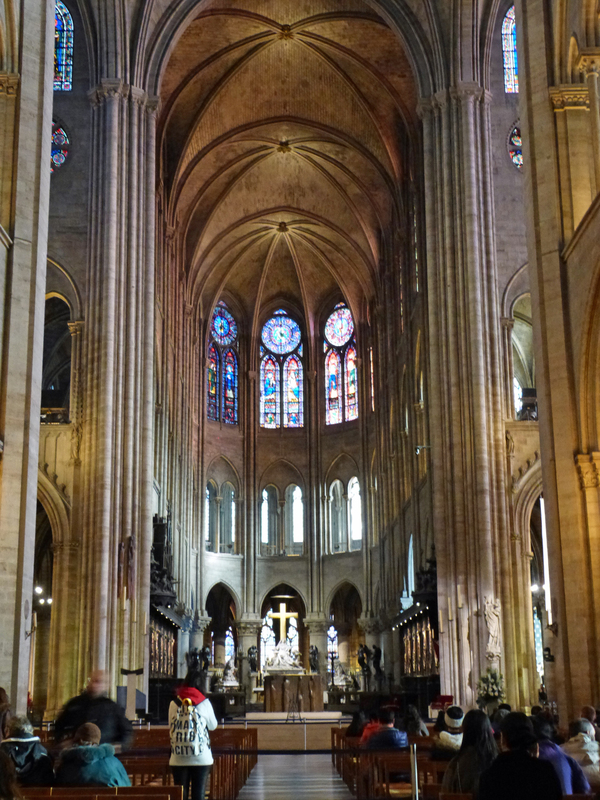 It was built for the king of France to hold a fragment of the True Cross of Jesus. 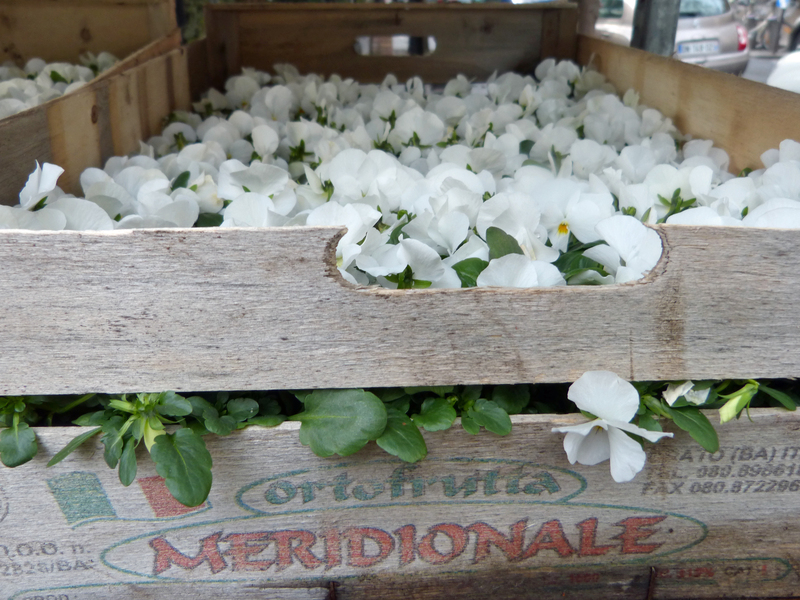 A bit more up-to-date: pansies for spring offered in the flower market near Notre Dame. It’s quite a large island and has parks at either end as well as an ancient hospital and several blocks of houses. And of course a giant cathedral and thousands of tourists! 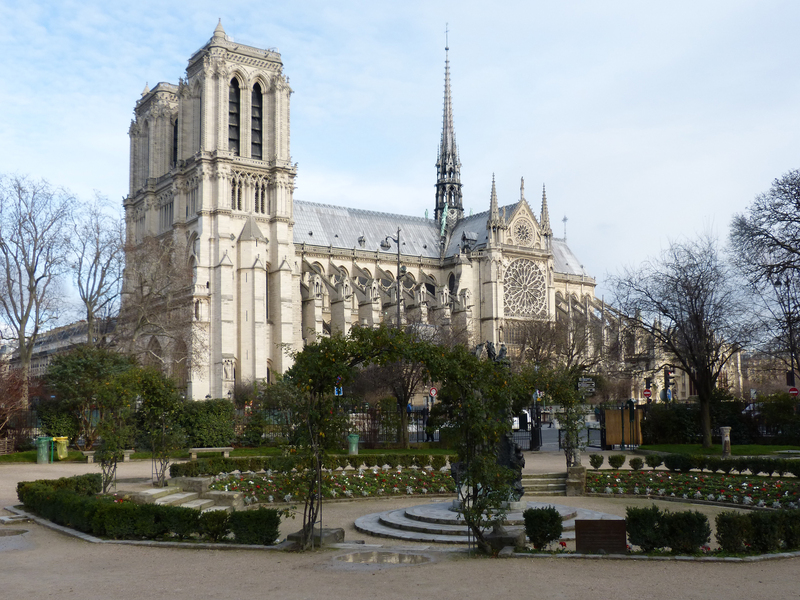 Begun in the year 1163 and consecrated in 1345, Notre Dame de Paris is one of most famous churches in the world. A view of the main altar. 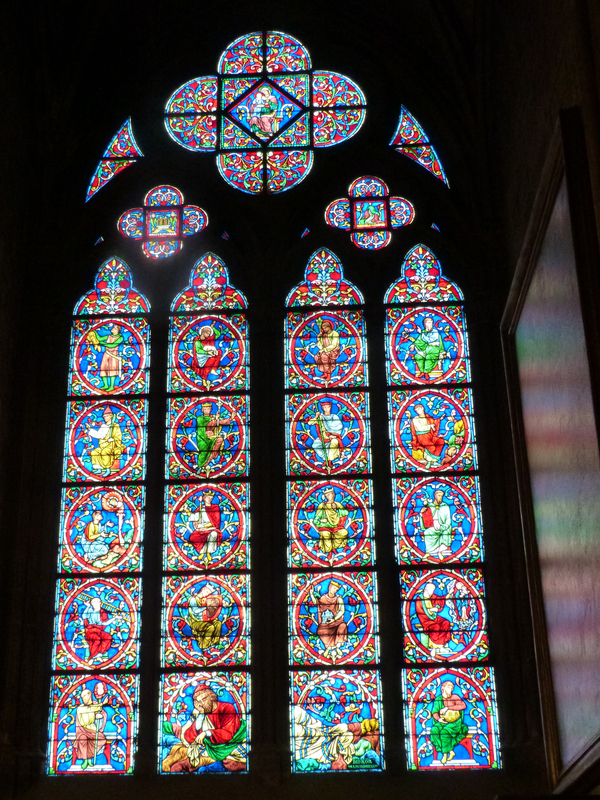 Another of the many gothic stained glass windows that line the walls of the cathedral. On the other side of the river I wandered into some of the streets which have never been modernized. This is the way all of Paris was until the late 1800s (although not so well painted). Again, pictures tell the story better than I can. 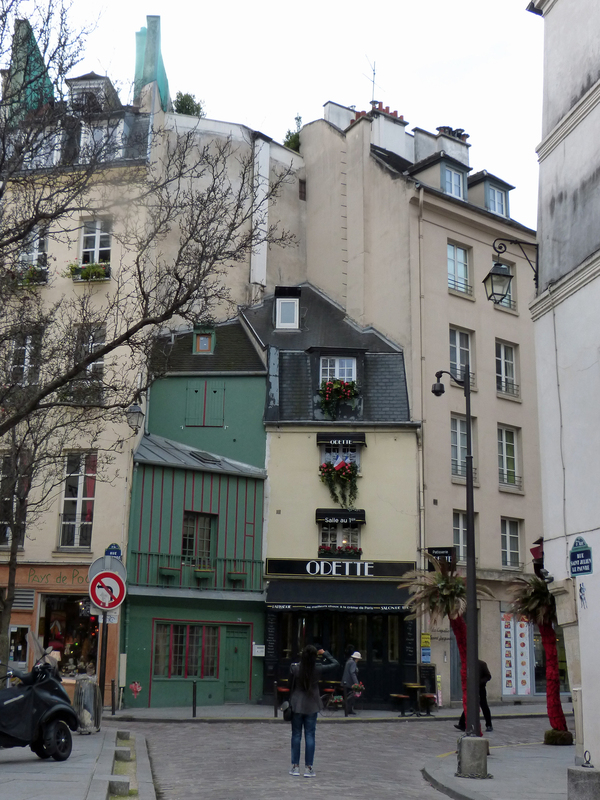 Two small narrow houses that have somehow survived for centuries and are among the best-loved buildings of Paris now. 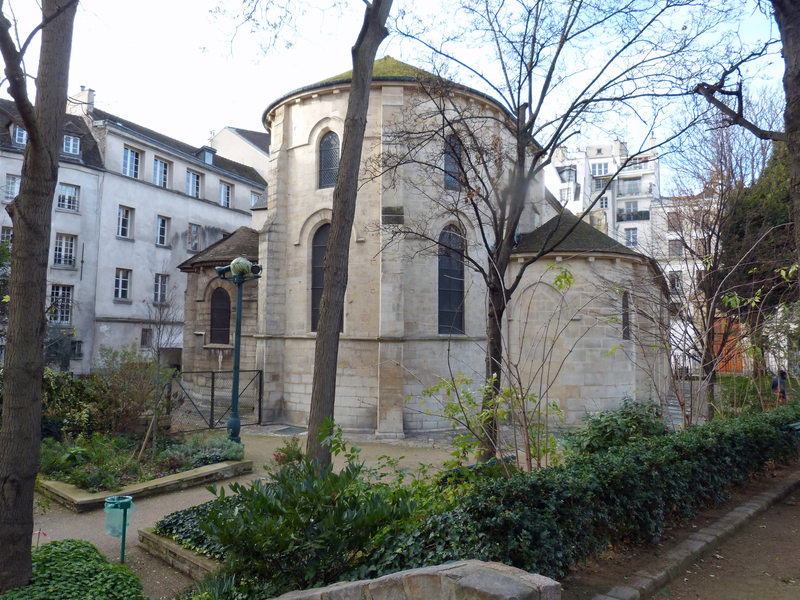 Located just across the river from Notre Dame, and surrounded by lovely gardens, this small church was built in the 13th century on the site of one from the 8th century. I’m tired tonight. In the past week I’ve walked about 36 miles! Incredible, even to me and I”m the one who did it! I may not be any skinnier but I’ll bet I’m shorter! This is the end of my tour of Paris. Tomorrow I’m taking a train to Antwerp, Belgium where I’ll be for the next two weeks. Probably I won’t write on the blog tomorrow but if I do I’ll email you. New things to discover and new things to “show and tell” coming soon! THIS is how Paris is supposed to look in January! The weather won’t always be wonderful! Rainy day in Paris today, though it improved by mid-afternoon. A bit colder than it has been too. 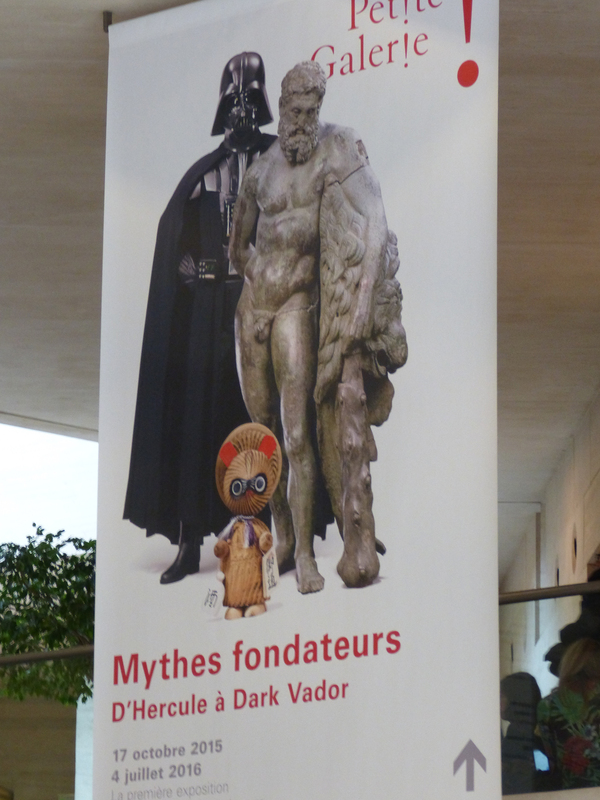 On Monday nearly every museum is closed except the Louvre so that’s where I went for my Parisian rainy day. I won’t show you the 80 pictures I took of wonderful works of art nor will I tell you how many Virgins are in Paris (thousands!) and where most of them will be found. I’ll show you just a taste of this magnificent palace to remind those who have been there of their visits and to tempt others into coming to France. A view of one bit of the enormous building as seen through I.M. Pei’s Glass Pyramid. Just one example of how grand this place is. There were two Michelangelo sculptures in this room. Yes! Of course the art I most wanted to see was in the far corner of the other side on the top floor! 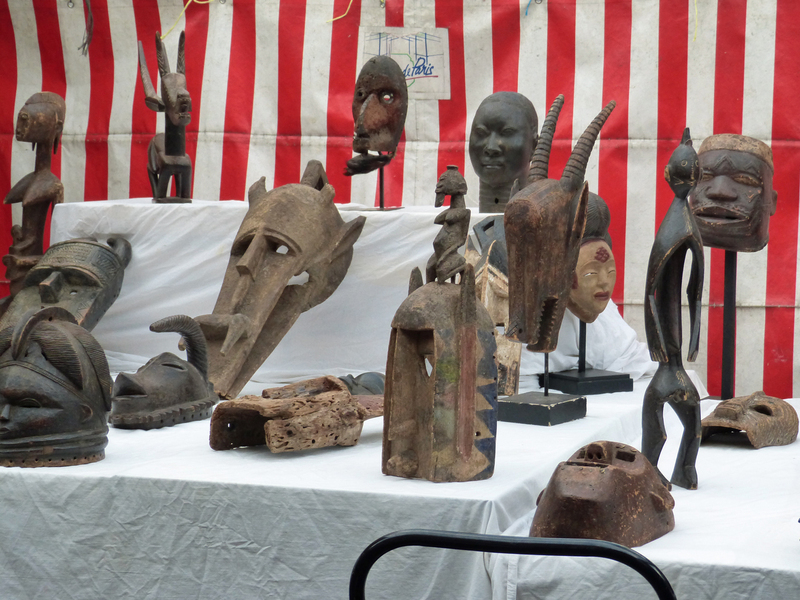 All across Europe open air markets are held on at least a weekly basis. In addition cities have large common market halls generally open six or seven days a week. 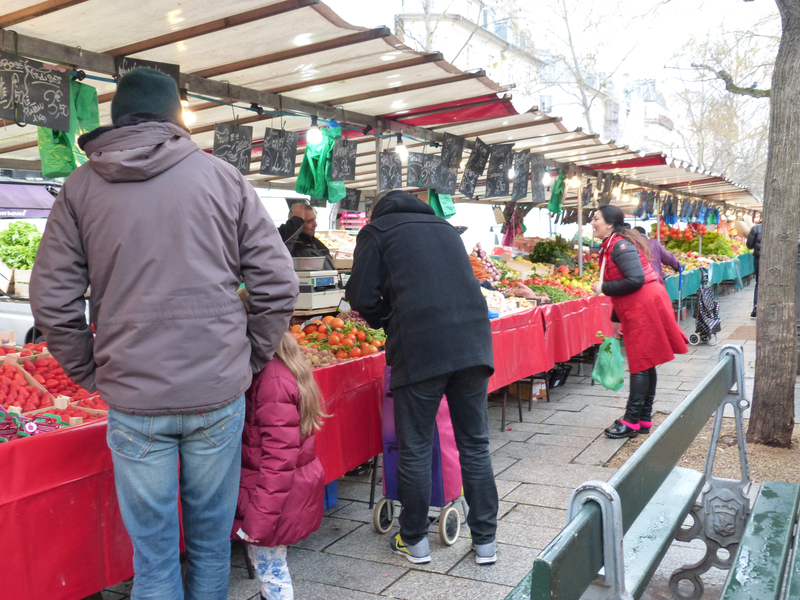 One of the largest and most popular markets in Paris is in the neighborhood where I’m staying. It’s called Richard Lenoir and it begins at the Place de la Bastille and extends for several blocks to the north. I was there early this morning. Here are some scenes I captured. 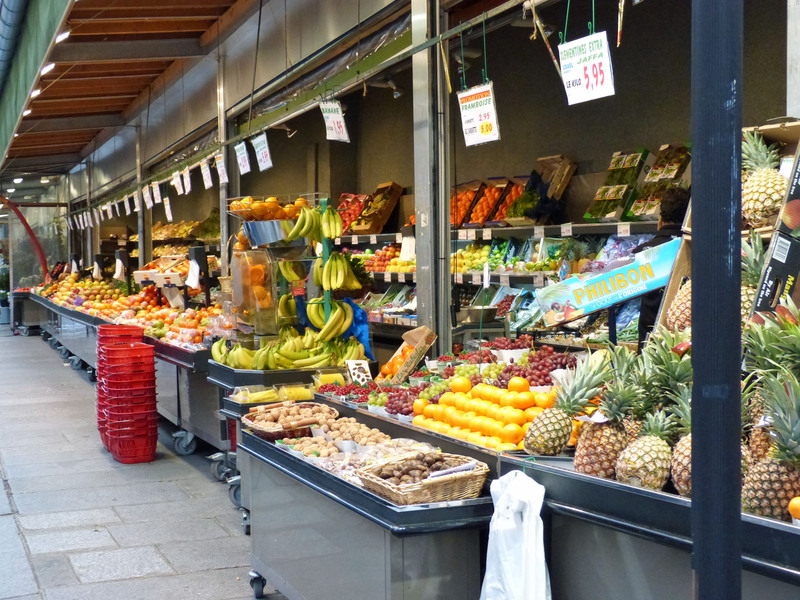 The displays of vendors selling vegetables and fruit are the largest category — as you see here, they go on for blocks. 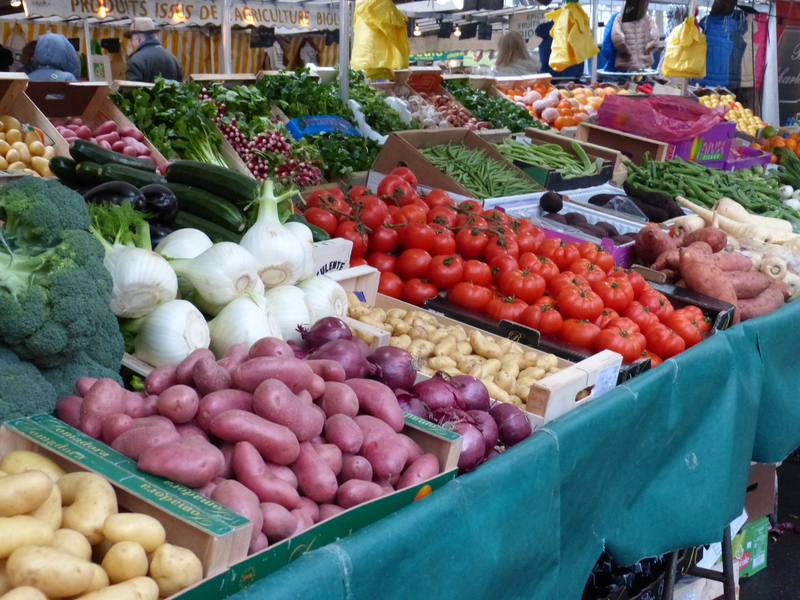 Foods offered at the markets are generally of excellent quality and they are always displayed well. 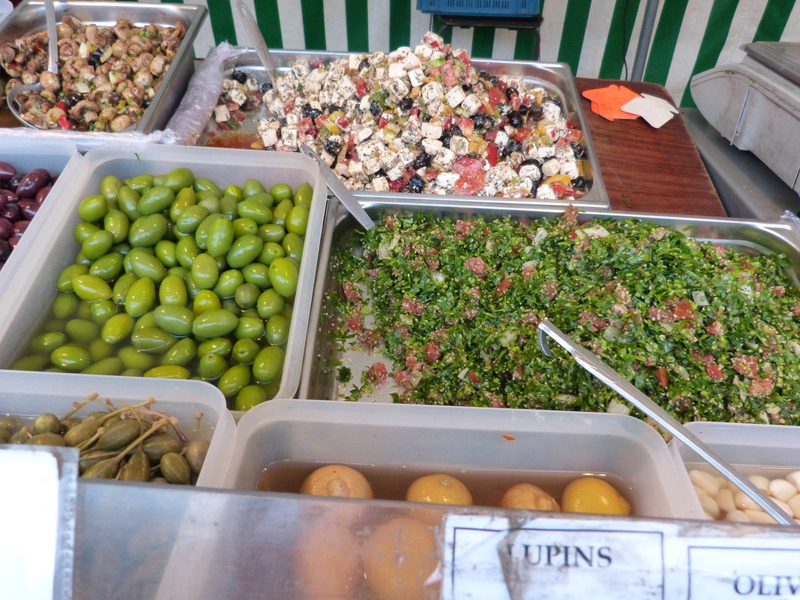 I would like to have made a meal at this Lebanese food stand but it was just breakfast time! No, this vendor isn’t selling poison! 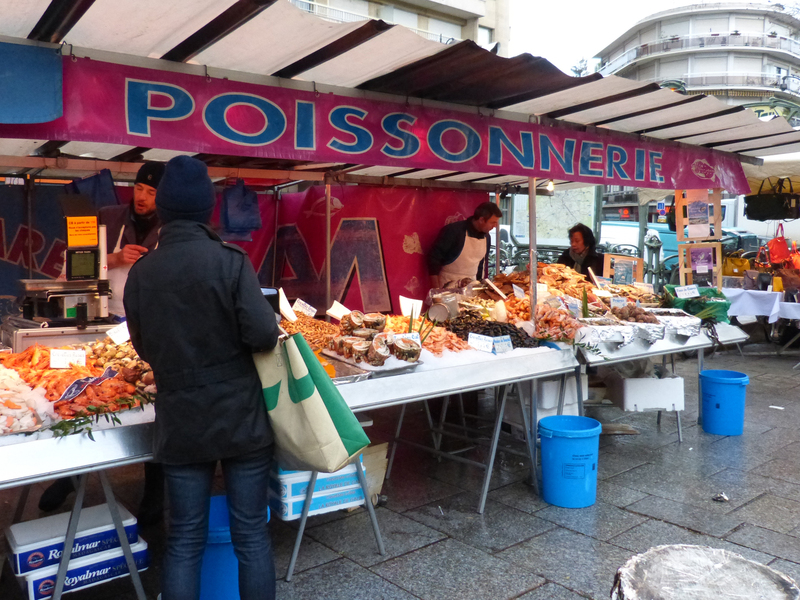 That’s the word for “fish seller” in French. This is only half the display at this stand — who knew there were so many kinds of seafood? 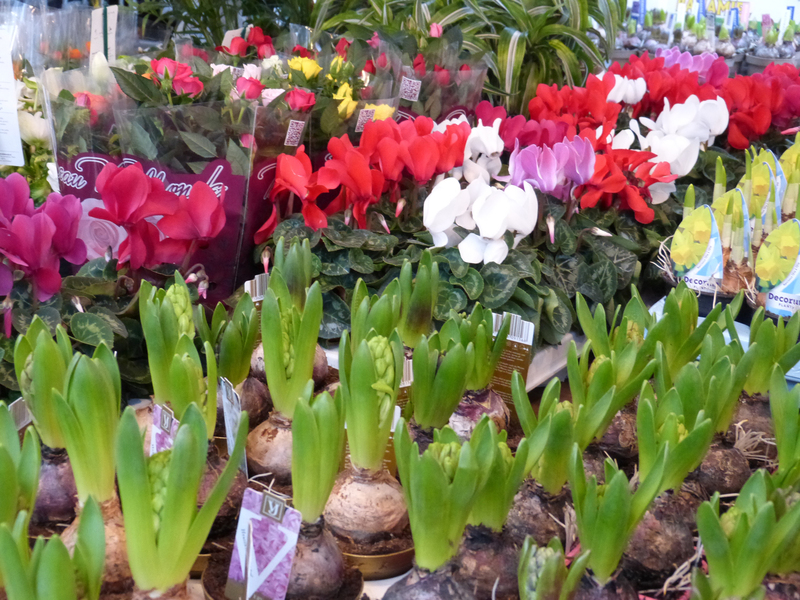 Flowers are another very popular item at every market, especially in late winter and spring. I would have loved to bring home food for dinner, but as you can see in this photo of my entire kitchen, my opportunity to cook is somewhat limited! Instead I’m going out for pizza and a beer! A Great Day to Be in Paris! This was another super day. The weather has really been terrific while I’ve been in Paris (considering it’s January). I didn’t even wear a coat today. Skies were blue with some harmless clouds and I went exploring! 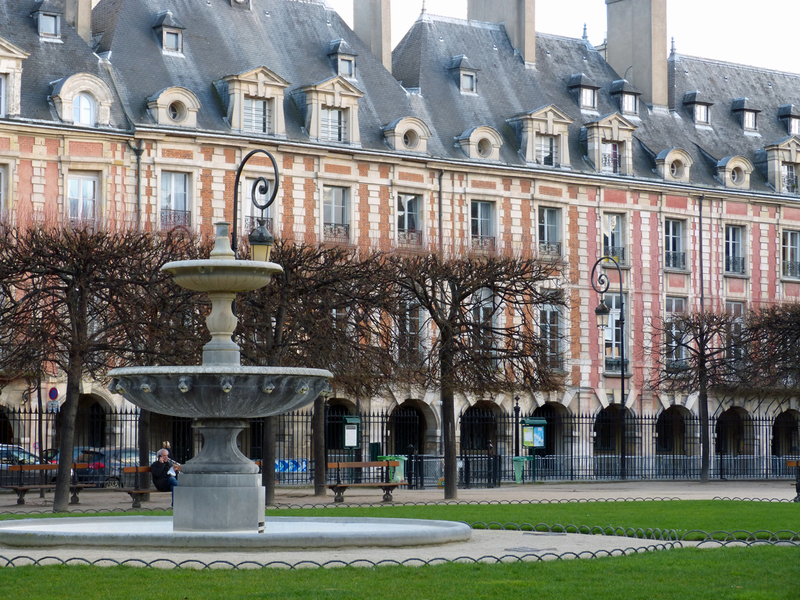 I began by walking through the Marais, the neighborhood that lies between my apartment and the center of the city. I sought out the traditional old Jewish neighborhood but because it was Saturday I found it mostly deserted and quiet – with the exception of soldiers with automatic rifles standing about 50 feet apart all along the streets. Next I met my friend Carole, an American who has lived in the very heart of Paris for 40 years. Carole has come to my aid many times when I’ve been making plans for clients in Paris. It was fun catching up on news of her life and her family. Café Louis Phillipe where I had lunch today! For the first time I had lunch today in a restaurant I’ve been photographing since 2004. The exterior of this café is very charming and it turns out that the interior is just as classically Parisian as the façade. 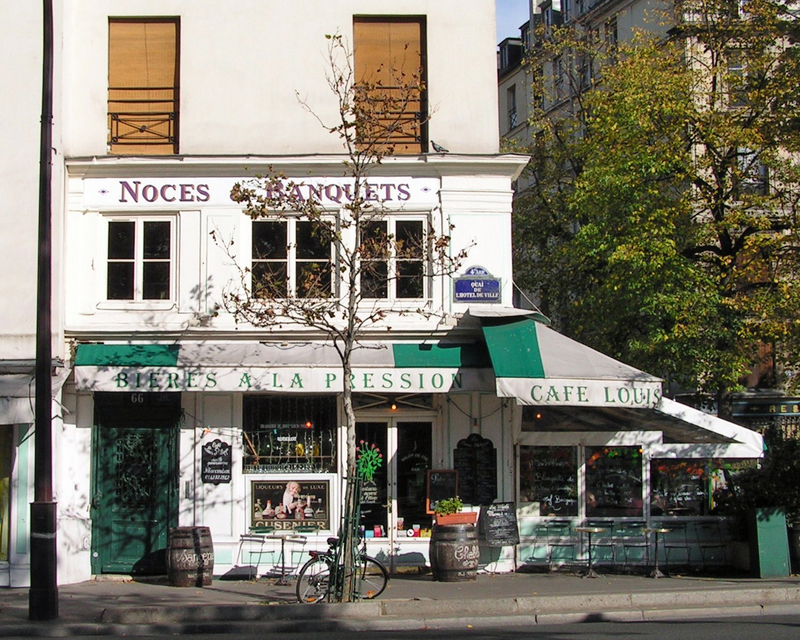 The place is called Café Louis Phillipe and it’s on the street that runs along the north bank of the river Seine. The food was excellent. I have been depriving myself of vegetables so I ordered a “Market Salad” for a starter. A variety of veggies dressed in Vinaigrette comprised the very large salad. It could well have been my entire meal but I had also ordered the “Estouffade de beuf aux olives” which is a fancy way to say “pot roast.” It’s unlike any pot roast I’ve ever had except that it contained large chunks of beef as well as browned pieces of bacon (which really flavored the stew), black olives and boiled potatoes all in a wonderful rich gravy. It was fine! Just copy and google the name as I’ve typed it above to see it and to find recipes. I’ll be remembering this one when I’m home. After lunch I boarded a “Bat-O-Bus” to sail on the Seine to the area where the Eiffel Tower is located. The French word for boat is “bateau” so that’s what all the river boats are called. This one is actually part of the Paris public transit system though it cost a lot more than a bus ticket. It was fun to be on the river on such a gorgeous day. On of many houseboats along the Seine. 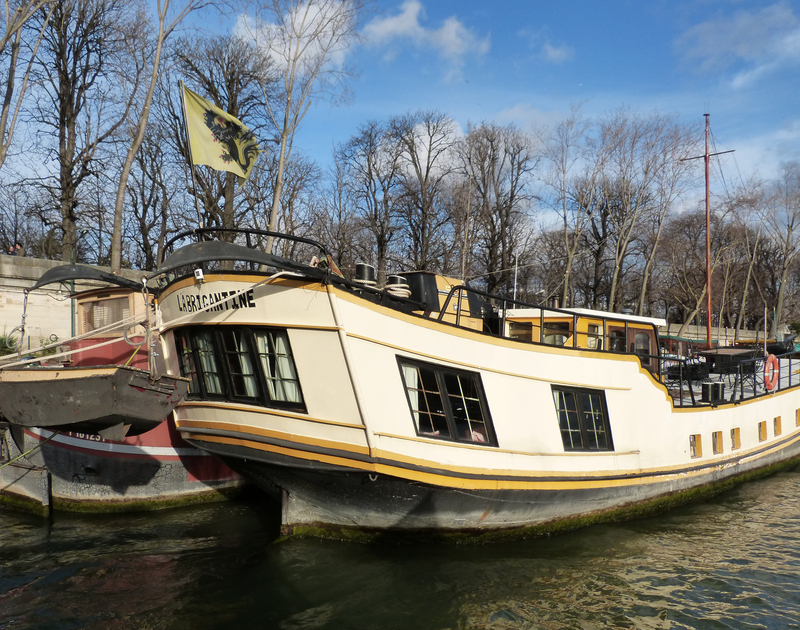 It’s very expensive to live in one of these old barges — and very cold in winter! My destination for the afternoon was the recently updated anthropology museum called Museum of Man (Musée de l’Homme). 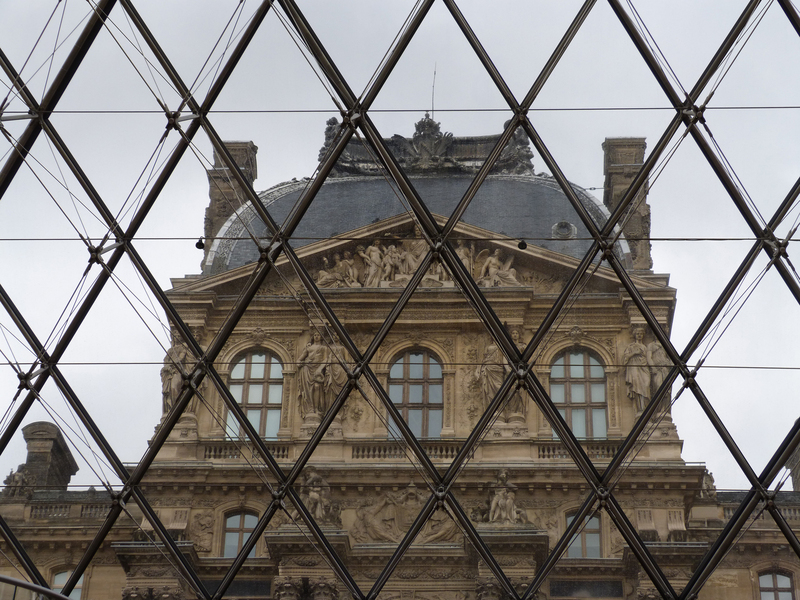 After a 50 million euro facelift that took more than six years the museum was opened in time for the global warming conference which was held in Paris in December. Using modern displays and graphics, the museum covers the history of mankind from our creation until today. I took many photos but it was so crowded, especially with families with school age children, that none of them are worth posting here. 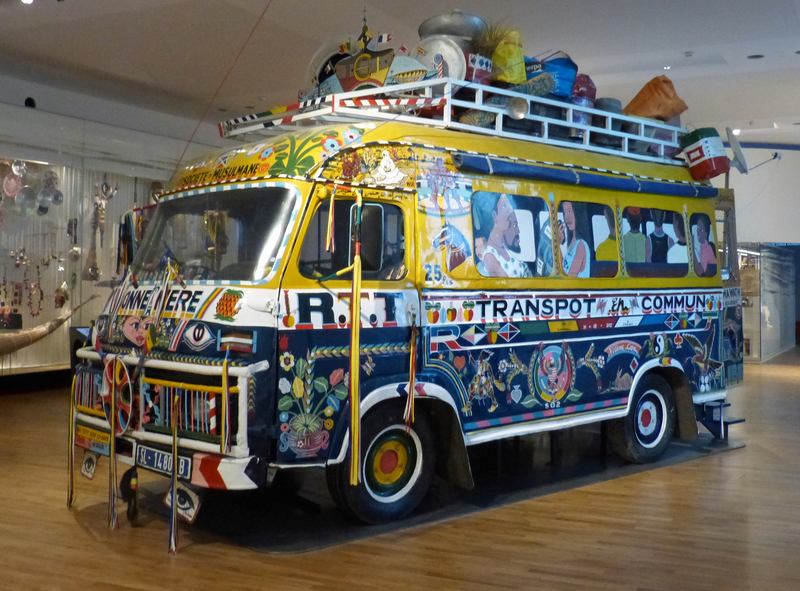 There was this one interesting old van called “the Muslim Shuttle” (in French) that I’m guessing was brought from Haiti or some place in Africa because the interior displayed video of the people who would have used it. I could find no explanation of where it had been used or why it was there but perhaps you’ll find it’s appearance interesting, as I did. 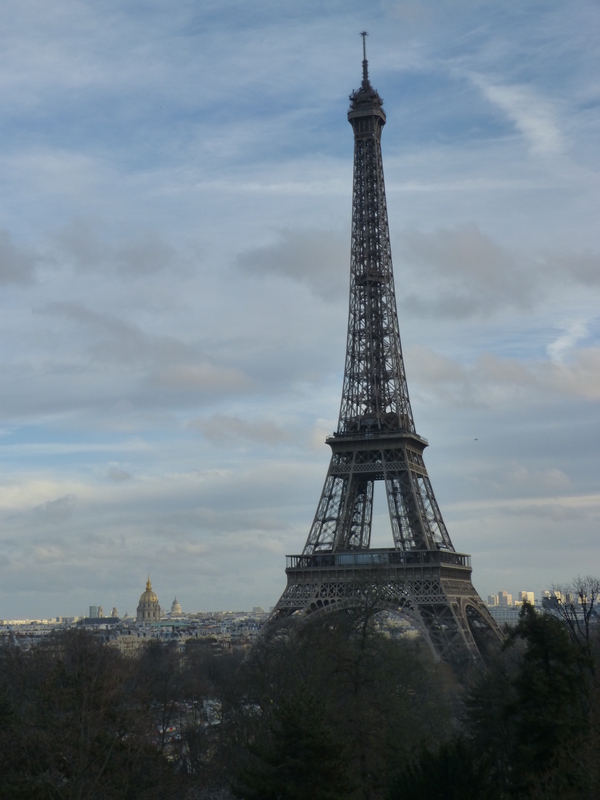 Finally, just to prove to my granddaughter Sarah that I went to the Eiffel Tower, here’s one more picture of Paris’s best known icon. My favorite pictures you haven’t seen yet! 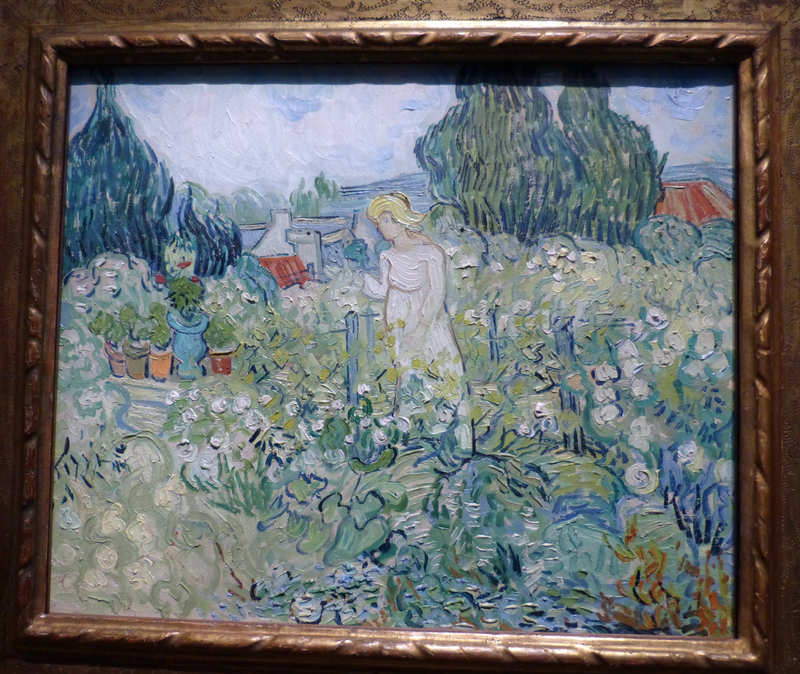 One of Vincent VanGogh’s last paintings. I looked through all the pictures I’ve taken since I arrived in Paris and realized there are some I want you to see that I haven’t shown to you yet. So here they are! 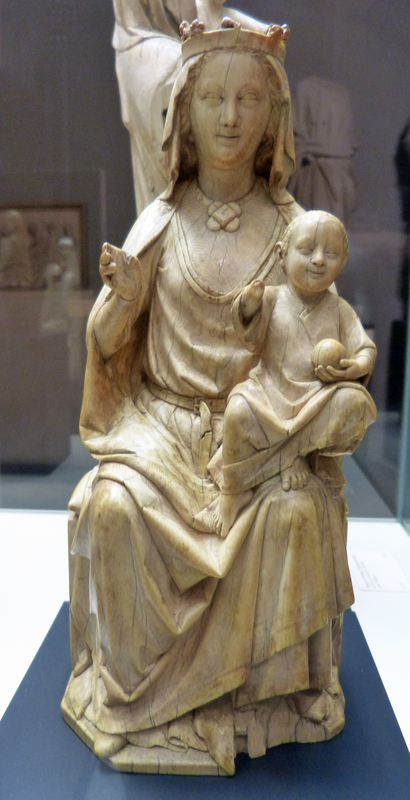 A happy-looking medieval Virgin and Child. 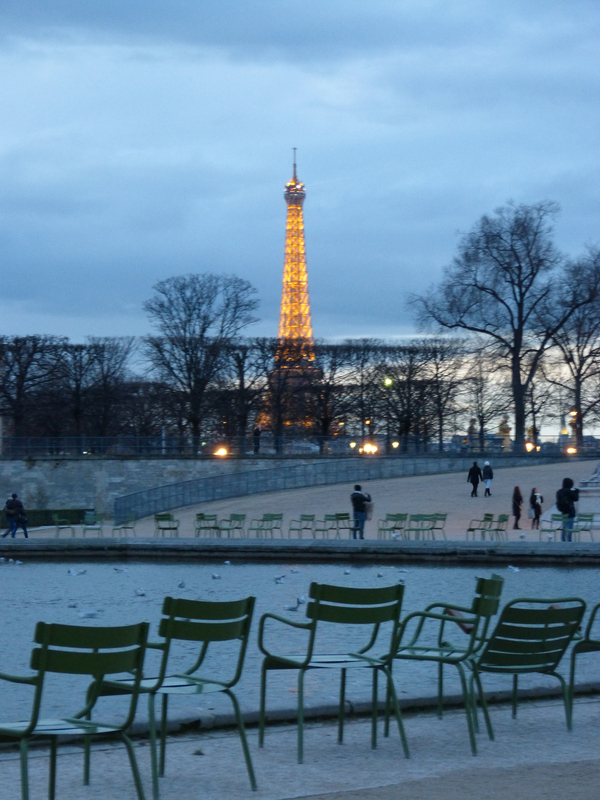 From the Tuileries Garden at twilight. 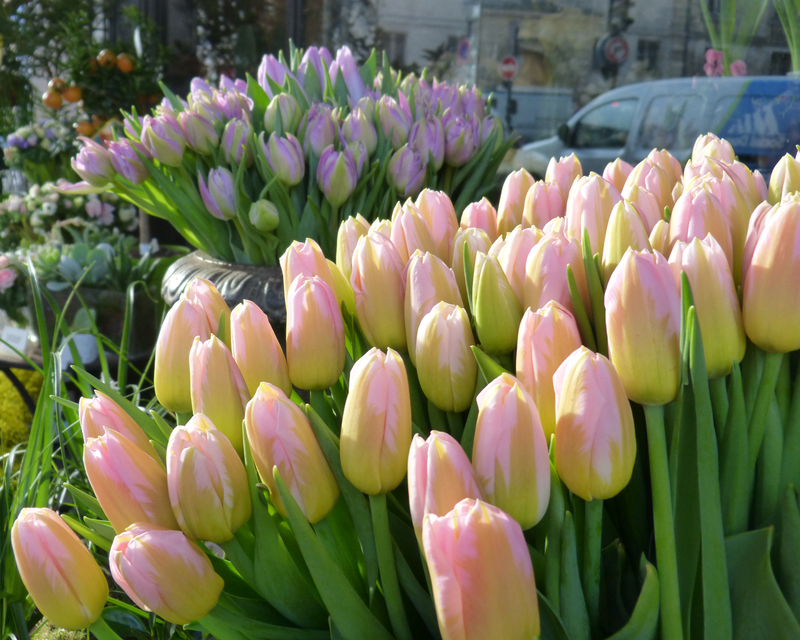 Florists’ shops are everywhere in Paris, and they make the city more beautiful by showing their wares on the sidewalk. I think this building is beautiful. 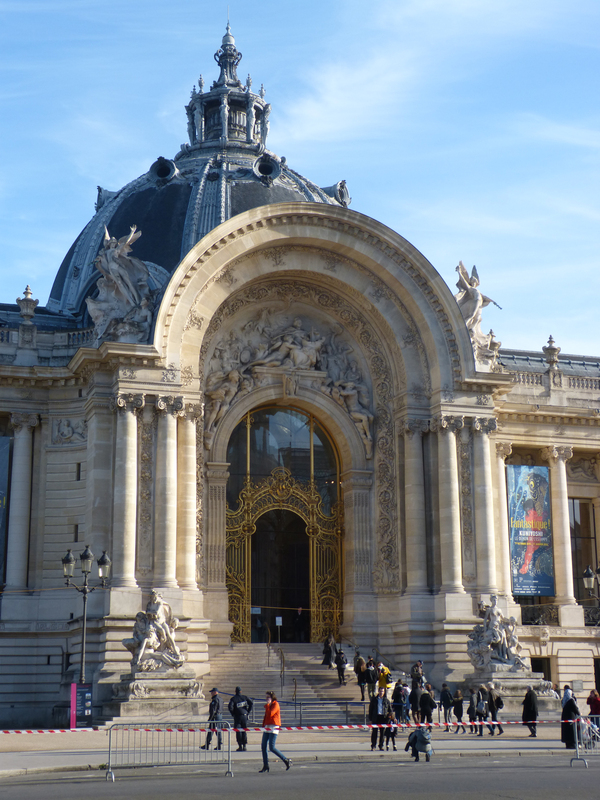 This is the entrance to the Petit Palais (small palace) built for a late 19th century world’s fair. The Grand Palais, across the street, is much bigger. Houseboats and restaurant boats in the Seine in the center of Paris. Now do you see why they call this the most beautiful city in the world? 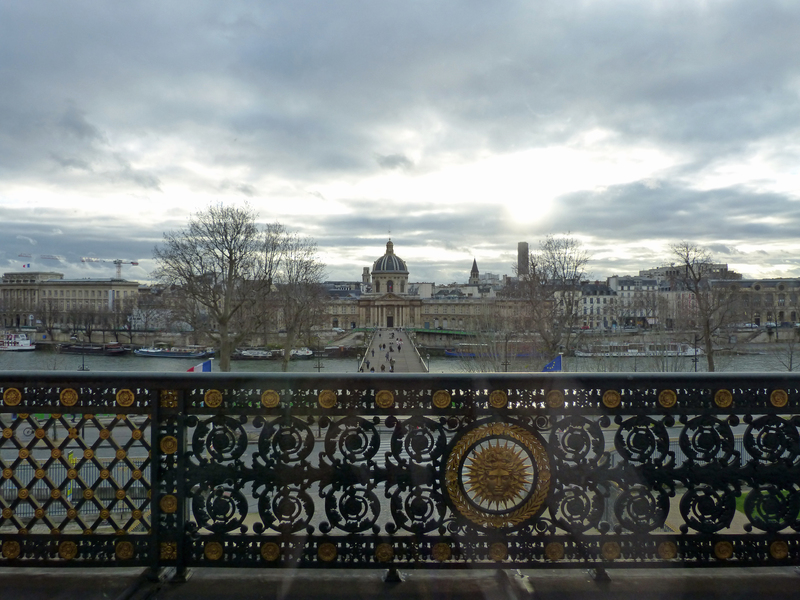 The sun peeked through the clouds in Paris today, making the beautiful city even more beautiful. 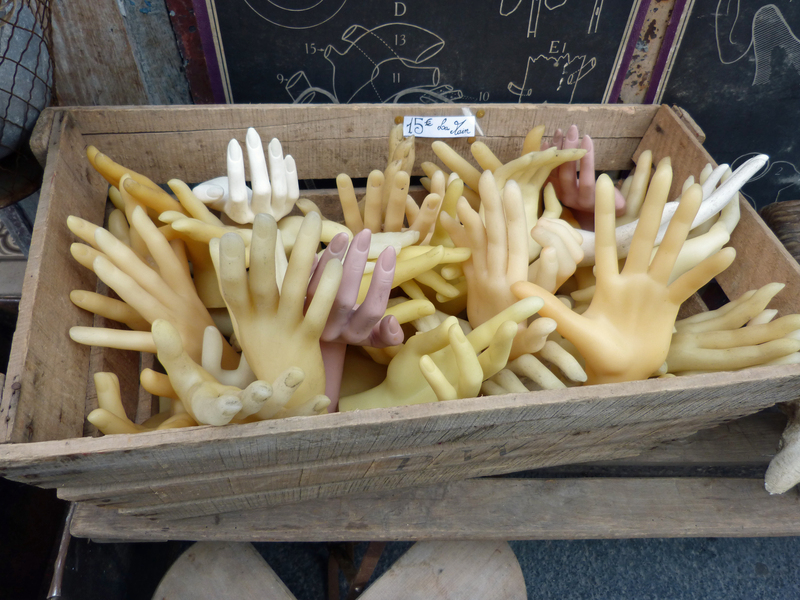 I checked three “must-do’s” off my Paris list today. I had my hair cut. I went to my favorite museum. I had the best hot chocolate in the world! Here’s a direct quote from an email I received from my future landlady in Ireland earlier this week: “But the best thing to do in Paris when your legs get tired is to go for a haircut. French hairdressers are geniuses!” I’ve always told everyone I could about how good the hairdressers in France are. It’s not just in Paris. In France some young people learn their trade by being apprenticed to an experienced person from around 16 years of age. They learn by doing and they learn from a master. Hairdressers are trained this way. 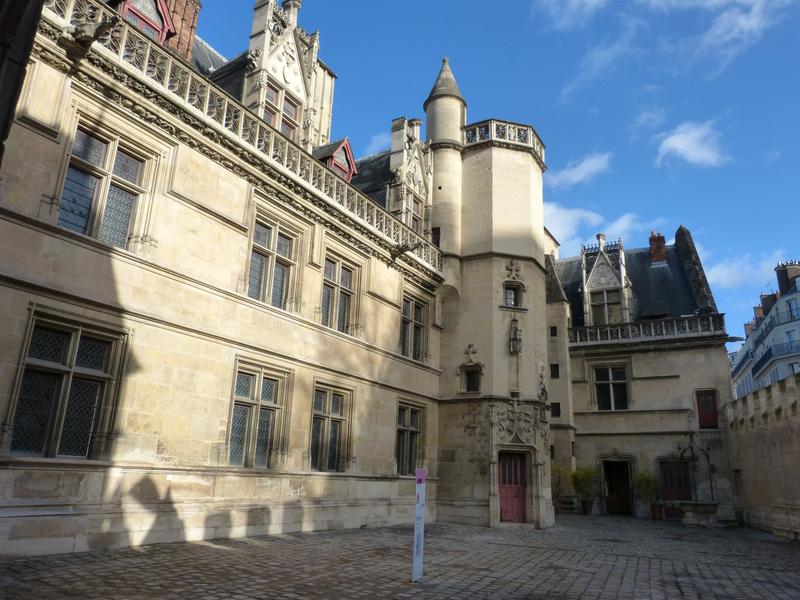 The second thing on my list was going to the Museum of the Middle Ages (Musée de Moyen Ages). This small museum is located in a 500-year-old abbey which in turn was built over a Roman bath. It is filled with beautiful religious sculptures, stained glass windows that are sometimes as much as 700 years old, and ancient objects made of gold. 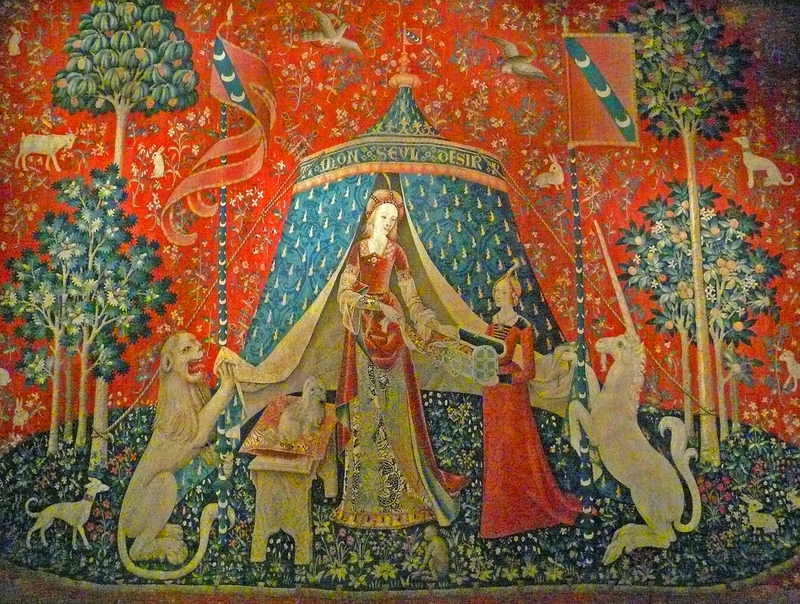 It is also the home of the famous “Lady and the Unicorn” tapestries. Here are some things I saw today. Ancient sculpture is one of my favorite art forms. 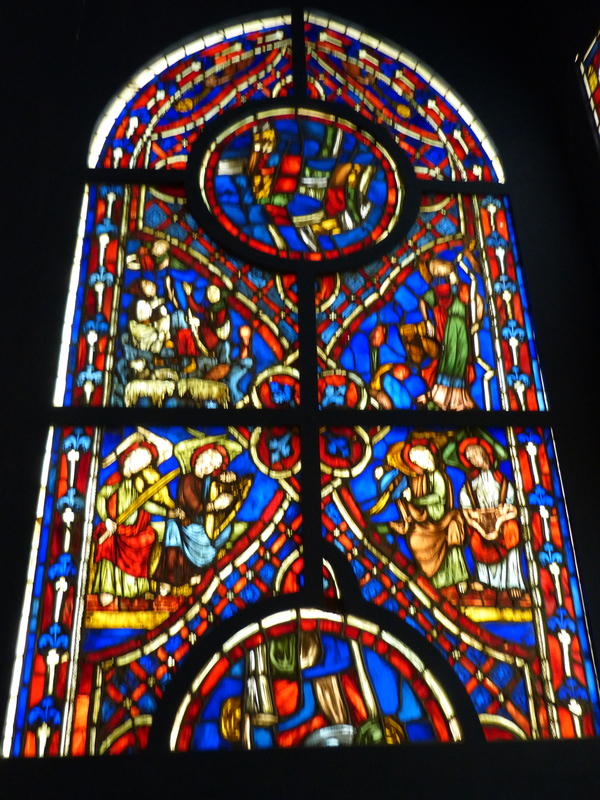 This beautiful stained glass window dates from around 1300 a.d. This is the old abbey that houses the Museum of the Middle Ages. The original exterior of the Roman baths over which the abbey was built. It’s on a very busy street in the center of Paris. Then I walked down the Boulevard St. Germain des Pres in pursuit of hot chocolate I remember having 12 years ago. The last part of that name – “des Pres” – means in the field, or outside the walls. This church celebrated its 1000th anniversary in 2014. 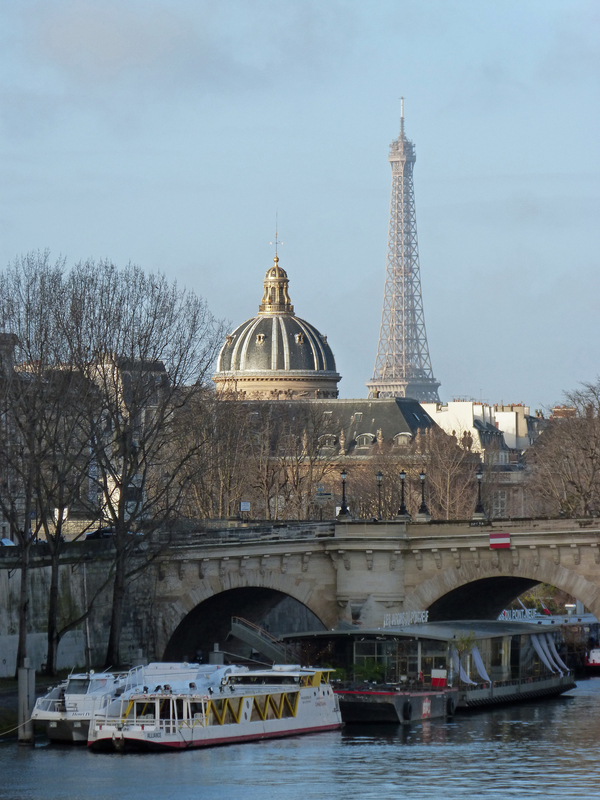 When it was built most Parisians lived on the islands in the river Seine where Notre Dame cathedral is now. This abbey was quite far out of town. In truth, it’s not much more than a mile from the cathedral but there was very little between the village that was Paris and the abbey. 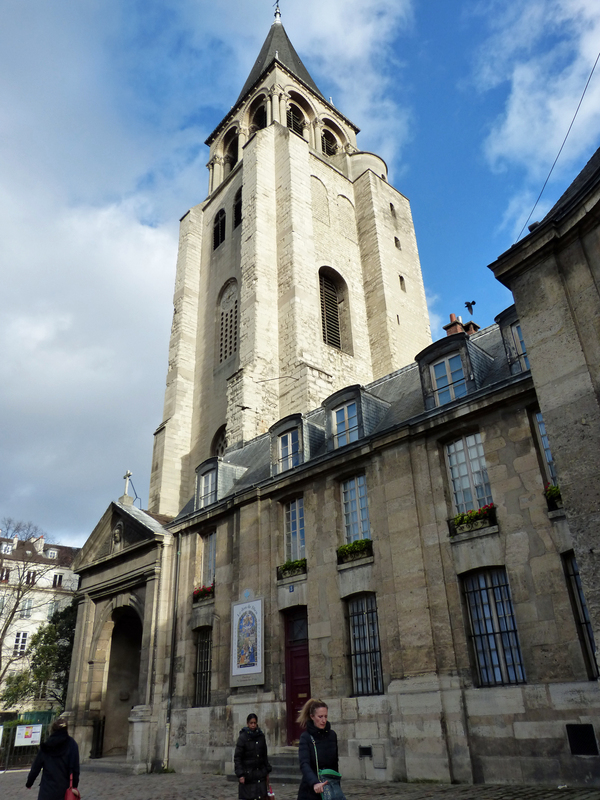 The thousand-year-old church of St. Germain des Pres. 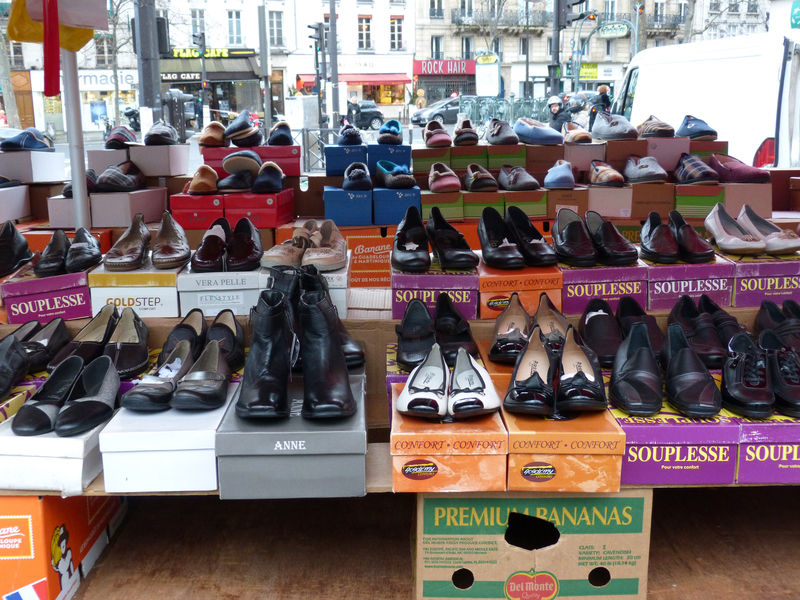 Today the Boulevard St. Germain des Pres is one of the busiest shopping/restaurant/hotel streets in Paris. It’s in the “Left Bank” which means south side of the Seine. It runs parallel to the Seine for a few miles. 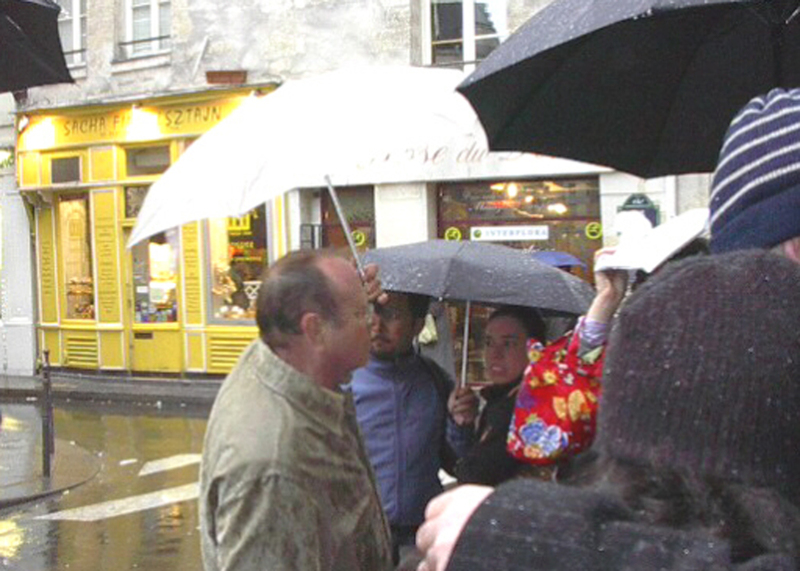 Among its most famous tourist destinations is a pair of old cafés called Les Deux Magots and Café de Flore. 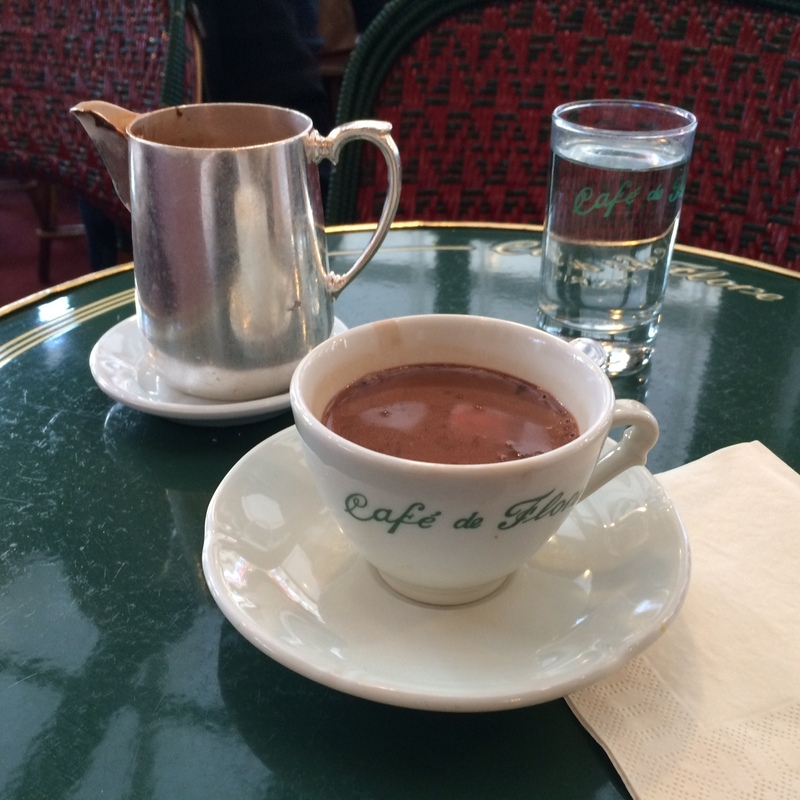 It was in the Flore that I had a cup of the fabulous hot chocolate I remembered. Chocolate so thick and sweet you think the spoon will stand on its own in the cup. It was just as good as I remembered! I’ve decided riding the bus around Paris is much better than riding the metro (subway). You can see so much from a bus, and it’s not crowded, and the name of each stop is called out by a computerized voice, which helps improve my French accent. So I rode the bus around town today, past many of the places I’ve already told you about and to my favorite museum. 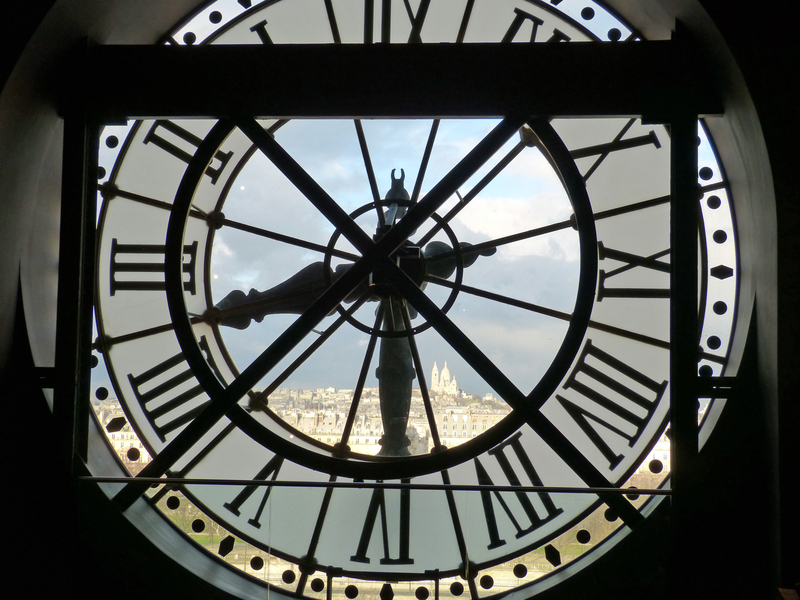 That’s the Musée d’Orsay. It has an interesting history, having begun life as a train station in 1900. In the 1960s an enormous new train station was built to serve the areas previously served by the Orsay station, causing it to be closed. 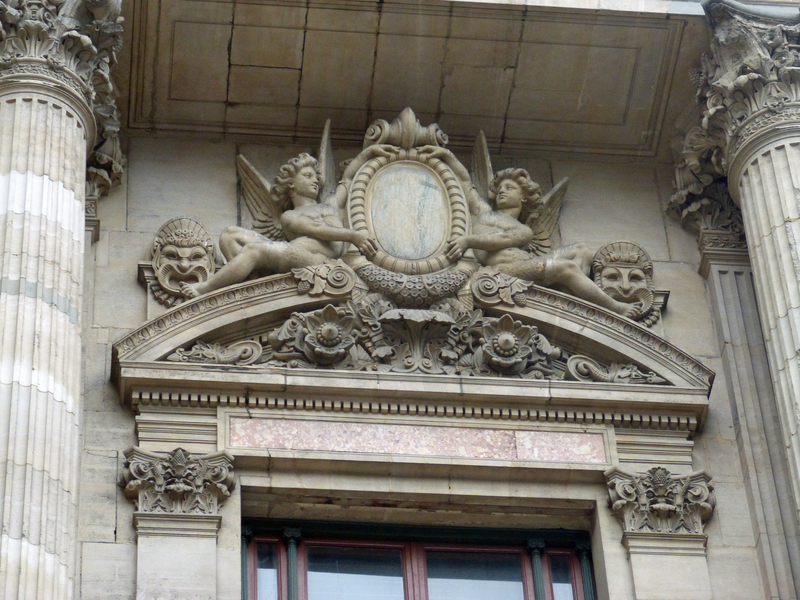 After a number of years it opened as an art museum featuring the works of late 19th century and early 20th century French artists. 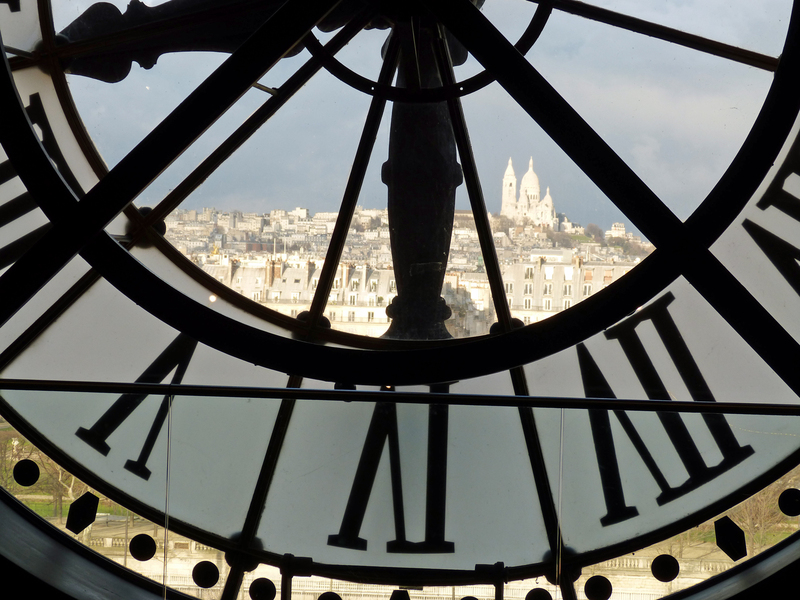 Most visitors come here to see works by the Impressionists such as Monet, Manet and Renoir. It’s easier to show you than to tell you about this big place filled with great art so that’s what I’ll do. 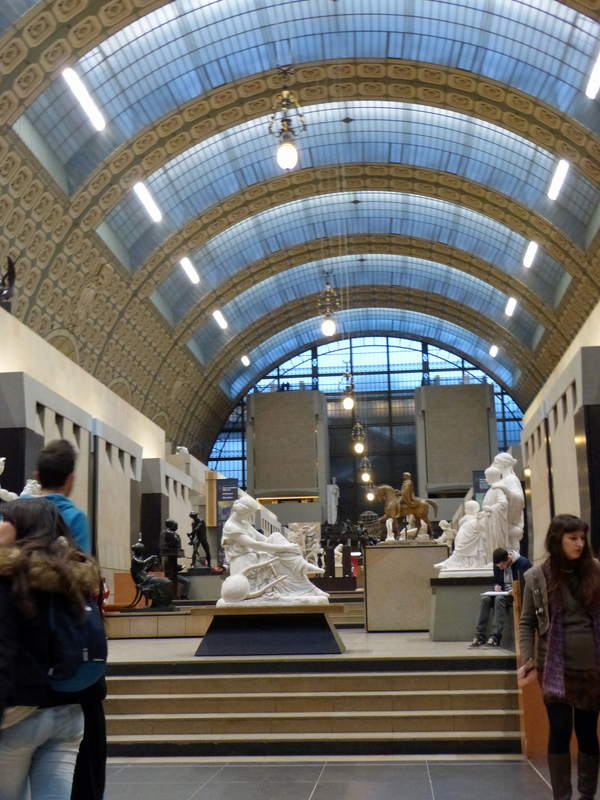 This is a view of the original waiting room, now filled with fine sculpture. The old hotel attached to the front of the building houses most of the paintings on its five floors. Because it was a train station there are two enormous clocks mounted on glass on the front of the building. 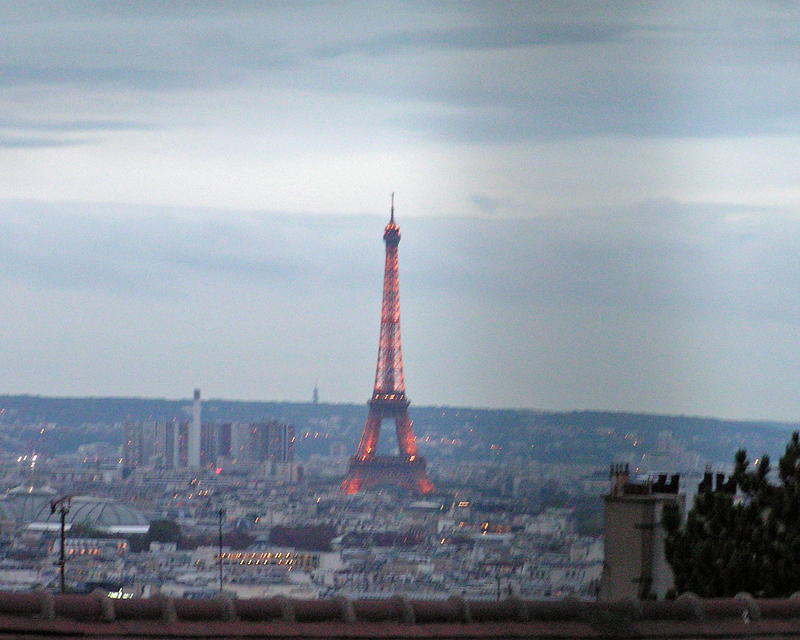 The view over Paris from the their 5th floor perch is wonderful. Look closely and you’ll see Sacre Coeur on top of Montmartre (that I wrote about yesterday). When I left the museum around 5:00 it was already quite dark. I had to cross the river on the bridge made famous recently by the thousands of “love locks” placed there by couples to symbolize their undying devotion. Last year it was decided to remove them. My grandson Chris mentioned them to me before I left and I erroneously told him they had all been removed. Probably about half have been, but as you’ll see there are still thousands in place. So Chris – hurry over! 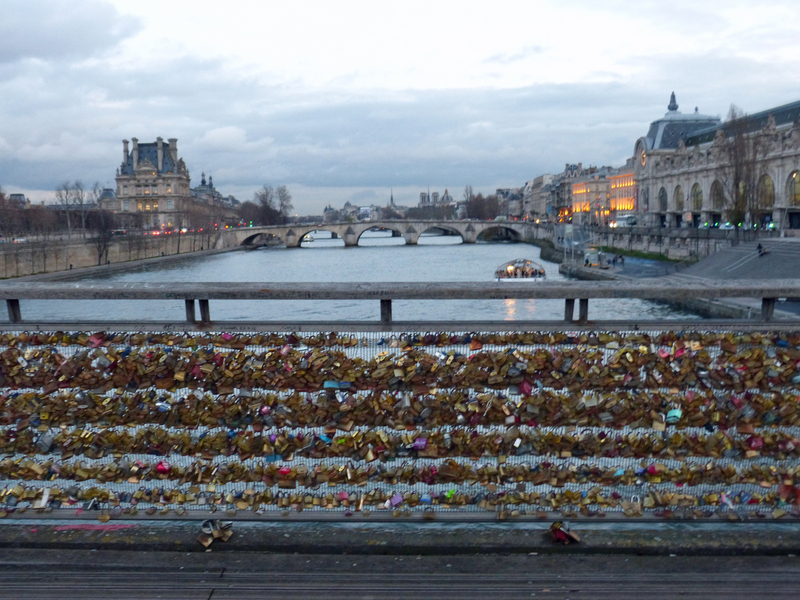 You can still buy a lock from a guy on the bridge and pledge your love to Amanda. 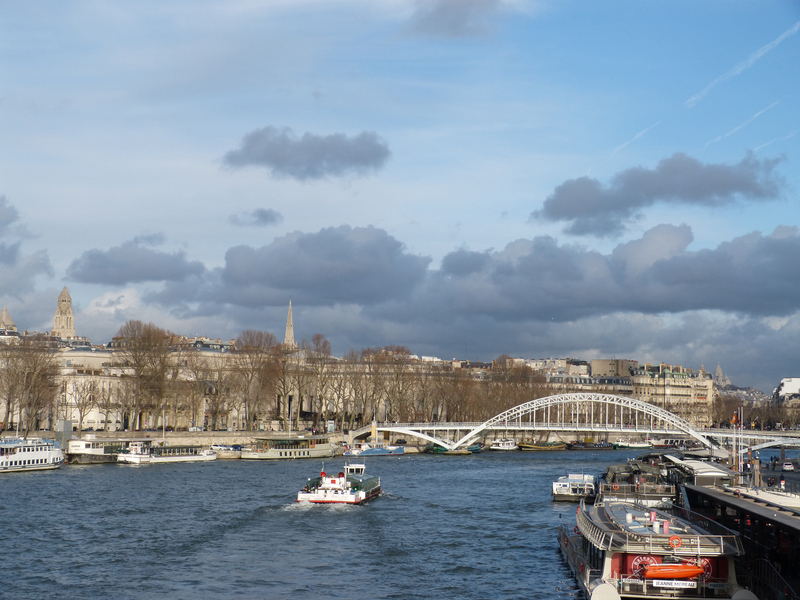 Here’s a view of the river Seine and the locks. 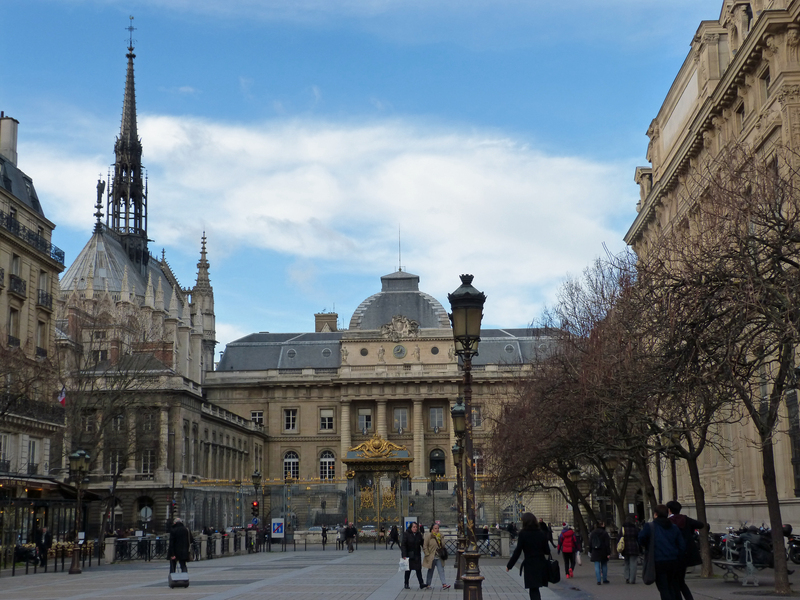 The building on seen on the right is the Musée d’Orsay. The tall building on the left is part of the Louvre. Once over the bridge I walked to the Place de la Concorde (center of Paris) through the park known as the Tuileries Garden. 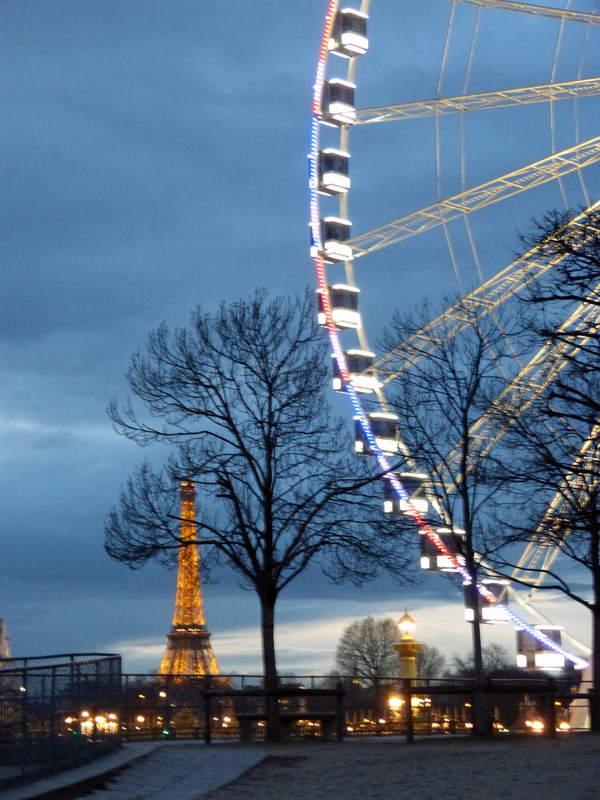 The views there of the ferris wheel and the Eiffel Tower were great, as you can see. 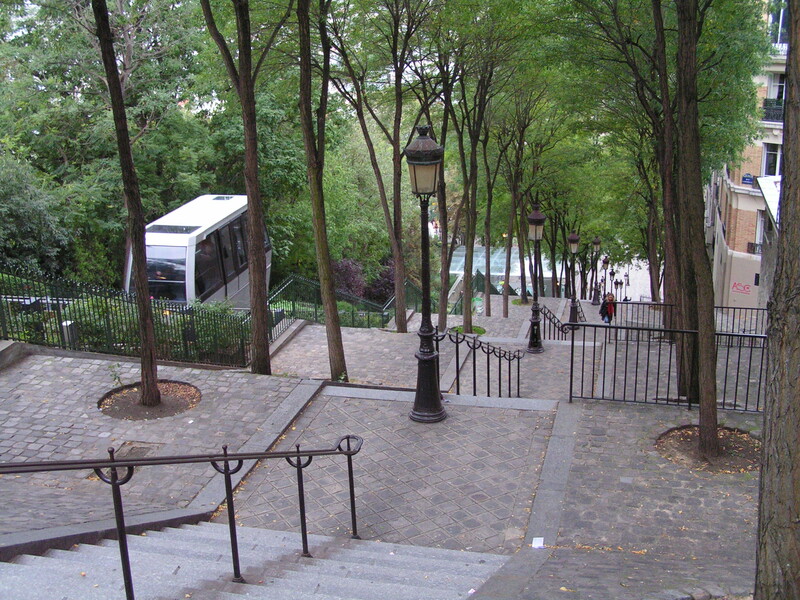 Montmartre’s hill is so steep that a funicular railroad has been installed leading to the basilica. I rode it down the hill today. 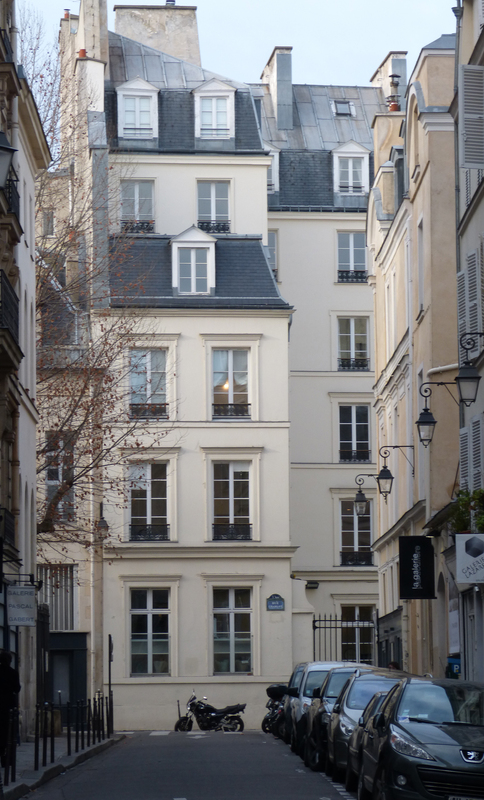 Recently I read a book about life on one neighborhood street in Paris, a street named rue des Martyrs. 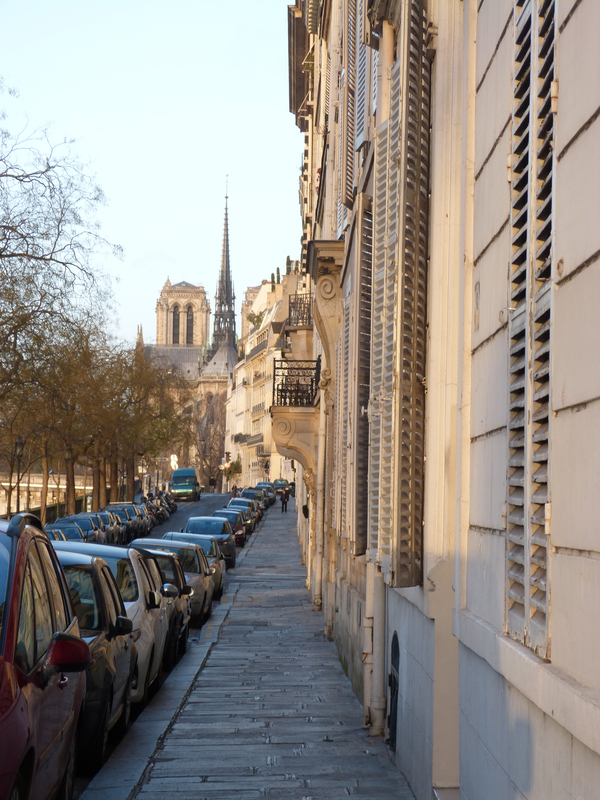 The book is The Only Street in Paris by Elaine Sciolino. 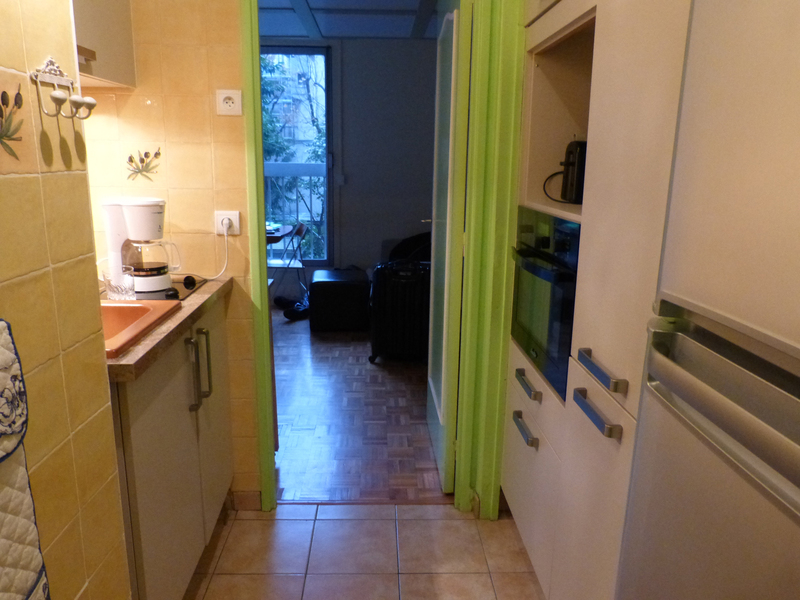 If the lives of ordinary Parisians interest you I recommend it. Because I liked it I planned to walk the six blocks or so that make up this small street on this trip and today was the day to do that. 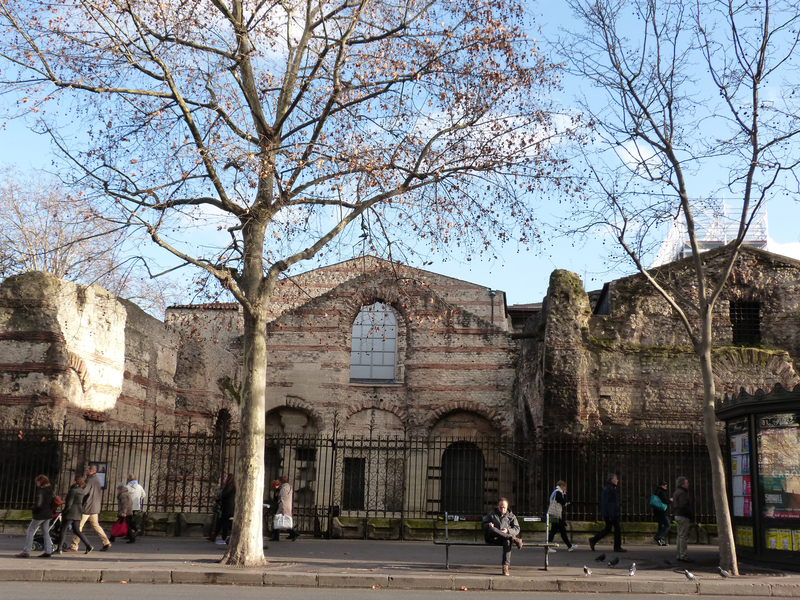 The name rue des Martyrs means street of Martyrs and refers to several early Christian men said to have been killed in this area by the Romans. 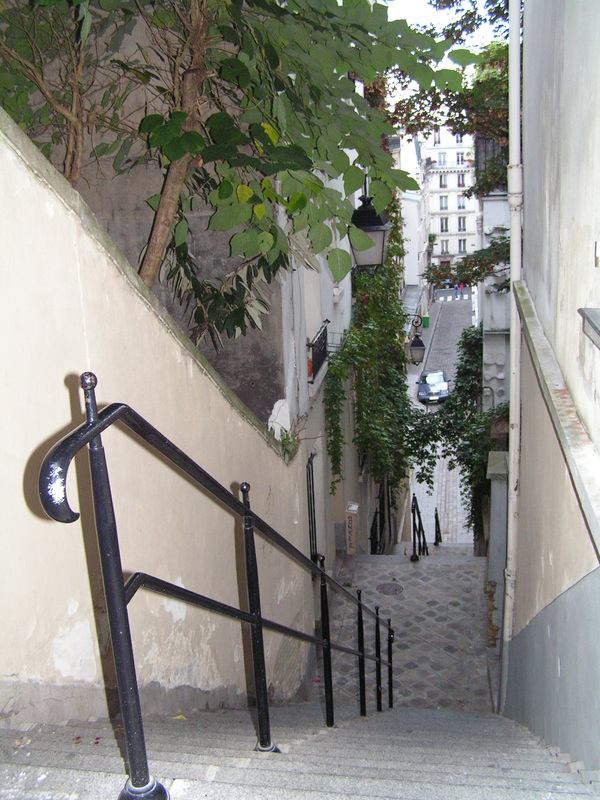 The northern end of the street is in the part of Paris known as Montmartre. It takes its name from the legend that St. Denis, an early bishop in Paris, after being decapitated picked up his head and walked a mile or more up the hill before dying to the area known “hill of the martyr” today. The basilica called Sacre Coeur. 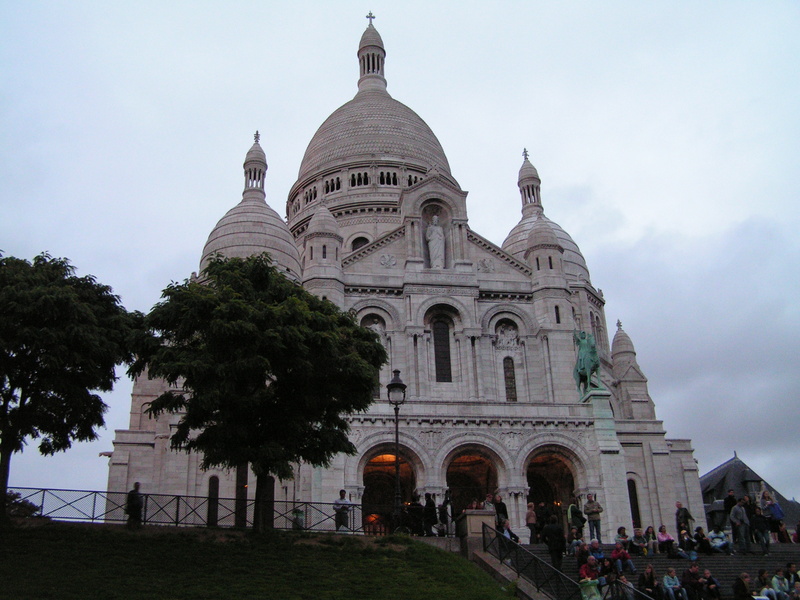 Today the best known place in Montmartre is a basilica called Sacre Coeur (Sacred Heart), a giantic church sited on the highest point in Paris. The church was built between 1875 and 1914 as a penance by conservative leaders of Paris. I felt a little like a martyr going there today because I probably climbed more than 200 stairs and spent an hour or more climbing the hill. This is not an easy part of town to reach by public transit. Some of the hundreds of stairs I climbed today! A poor picture used to give you an idea of the view from the basilica. 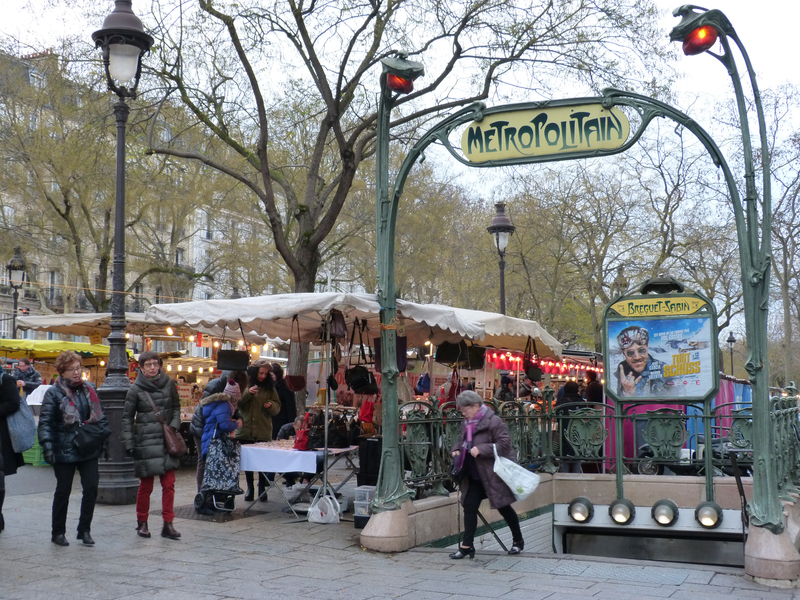 Rue des Martyrs is a mix of traditional old shops (such as butchers, bakers, fruit and vegetable vendors, and sellers of cheese and chocolate) and new retailers selling upscale clothing and other trendy merchandise. One of the several fruit and vegetable vendors on this short street. This one is the largest and is entirely outdoors. 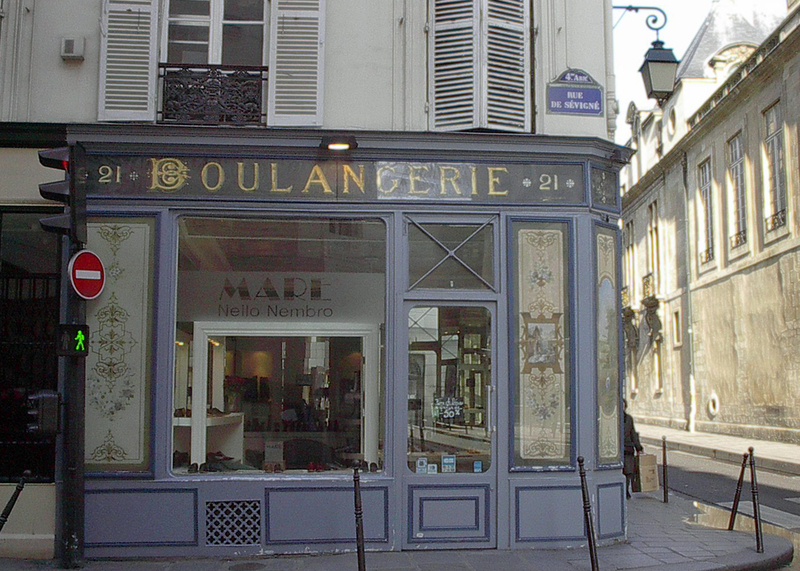 Paris has always been a city of very small retail establishments. As I walk through this city I wonder how people can survive and support a family on the income from a shop that repairs shoes or sells baby clothes or costume jewelry. There are hundreds of small, independent book stores in this city. 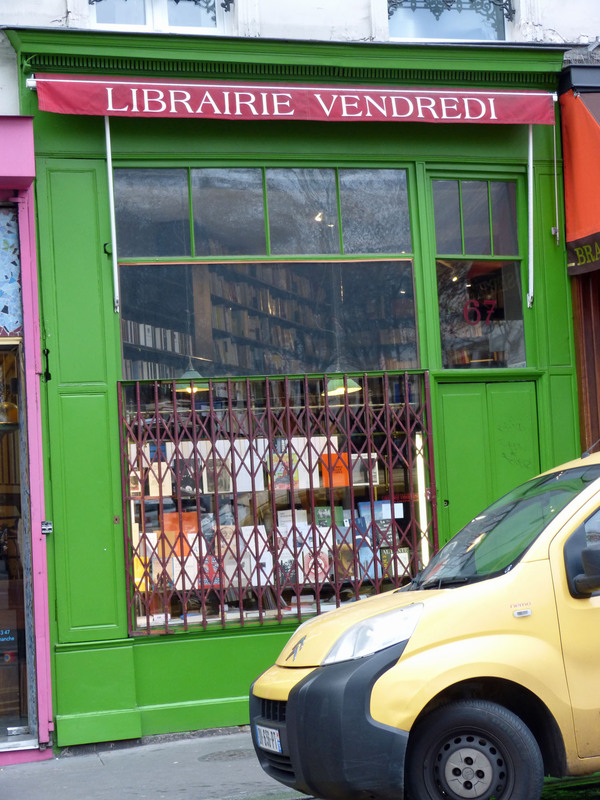 This little book store has been in business on rue des Martyrs for more than 100 years. Each time I’ve come here I’ve noticed more and more chain stores. As rents go up and the proprietors grow old, fewer of the tiny businesses are surviving. That’s the heart of the story told by the book about this street. 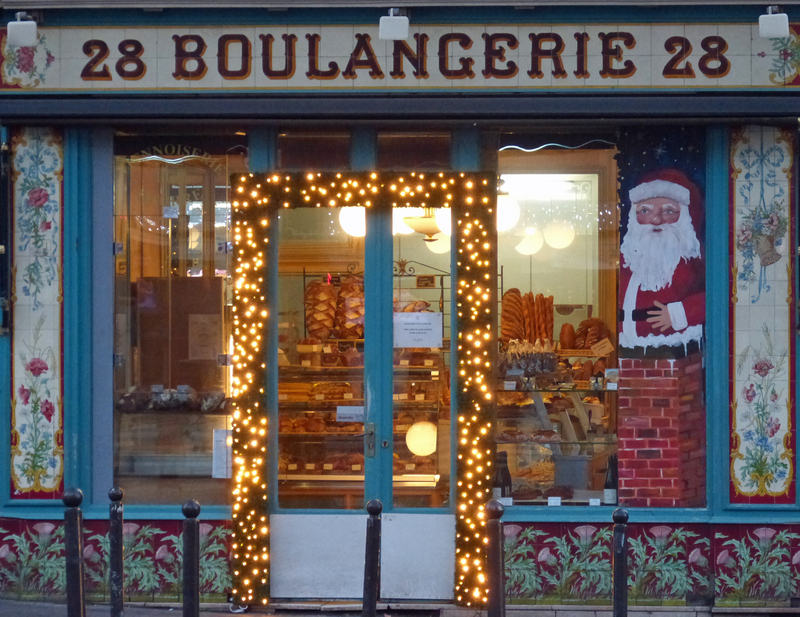 Nevertheless, there are still many thousands of very small, independent businesses throughout Paris. That makes it fun to wander these streets. 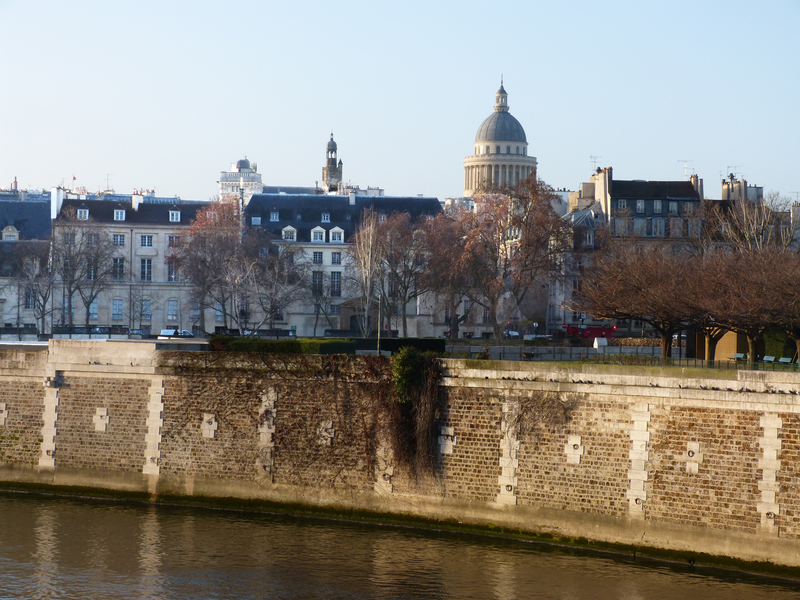 Old homes along the river Seine and a distant view of the Pantheon, the final resting place of some of France’s most admired men. Again today I walked five miles, this time from the east side of Paris to the center. Much of the time I was near the Seine. My destination was the English bookstore located near Place de la Concorde, the “centerpiece” of the city that I mentioned on December 31. I needed another who-done-it. I like to be up before the sun and out taking photographs in the morning light. That’s not a difficult thing to do here in the winter. Today the sun rose at 8:45 a.m. Here are a few places I saw as I wandered. An old bakery ready for its early morning customers. Do you see all the loaves of bread on the shelves, all freshly baked? A distant view of Notre Dame cathedral from an island in the river. 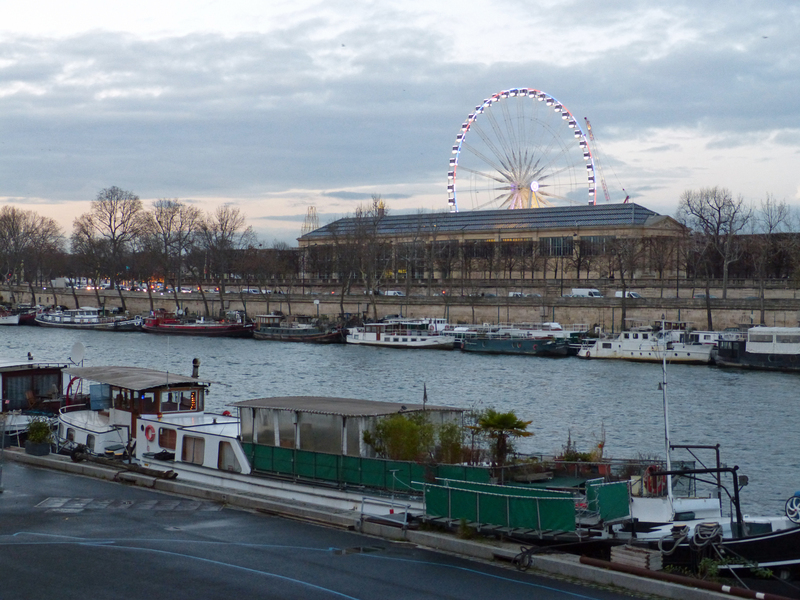 Boats parked overnight in the Seine at the Pont Neuf. In the distance the dome of the Institute of France and, of course, the Eiffel Tower. A liter of milk is €1.19 and the famous French baguette is usually under €1. The best yogurt ever is €1.39 and a package of fresh ravioli, large enough for four servings, is just €1.87. I was really pleased to discover the last jar of peanut butter in the store but it was no bargain: €4.20 for a small jar made from “American peanuts.” The French don’t like peanut butter! Today a euro costs $1.08. For the amount I paid yesterday for a pizza, ice cream and a beer at an inexpensive restaurant (€30) I purchased all the food I need for the next three days at the market.